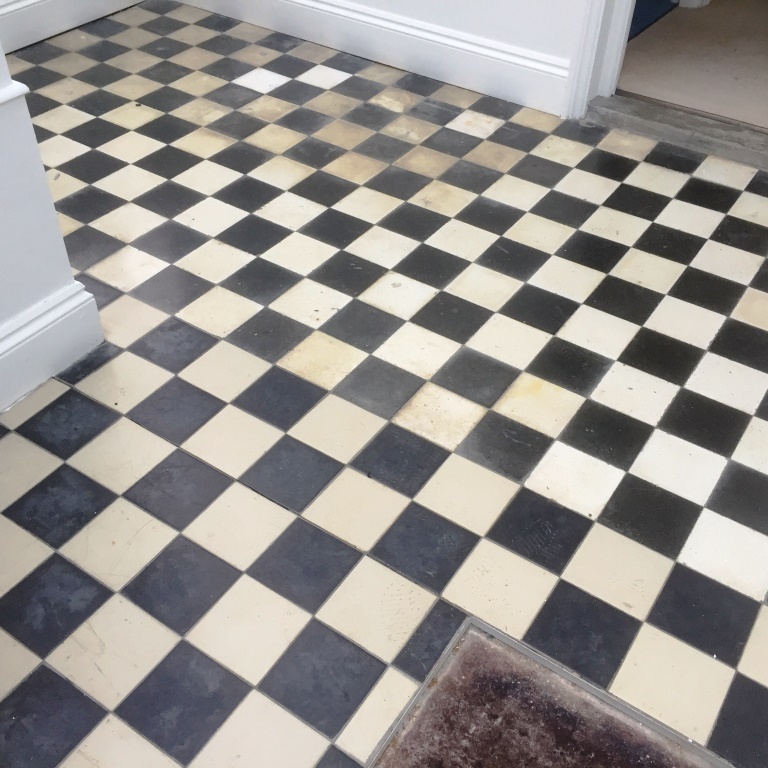 If you have a Mable tiled floor which is not looking its best, then the transformation I achieved on this floor at a property in Weybridge will definitely be on interest. 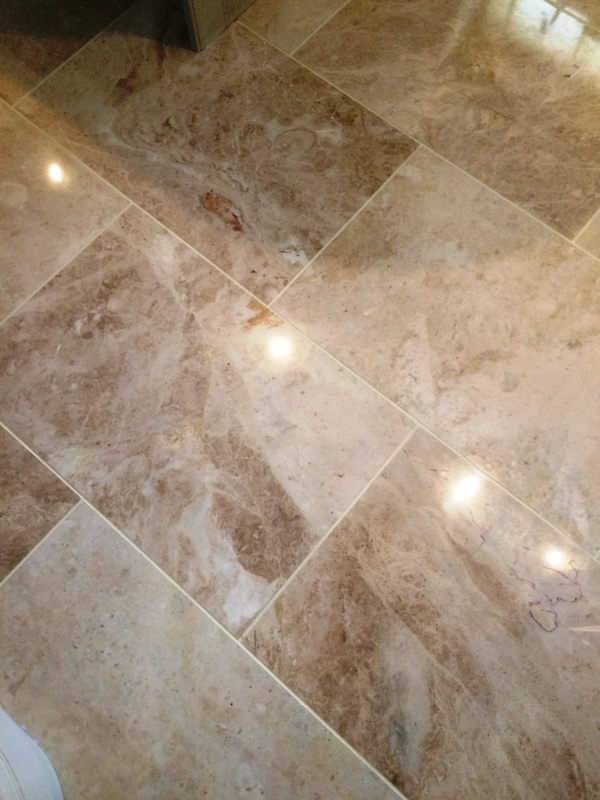 Having first spoken with the owner on the phone I went over to the house to take a better look at the floor and found that the deep red and brown Marble tiled kitchen floor was really dirty and totally lacking in colour or polish. 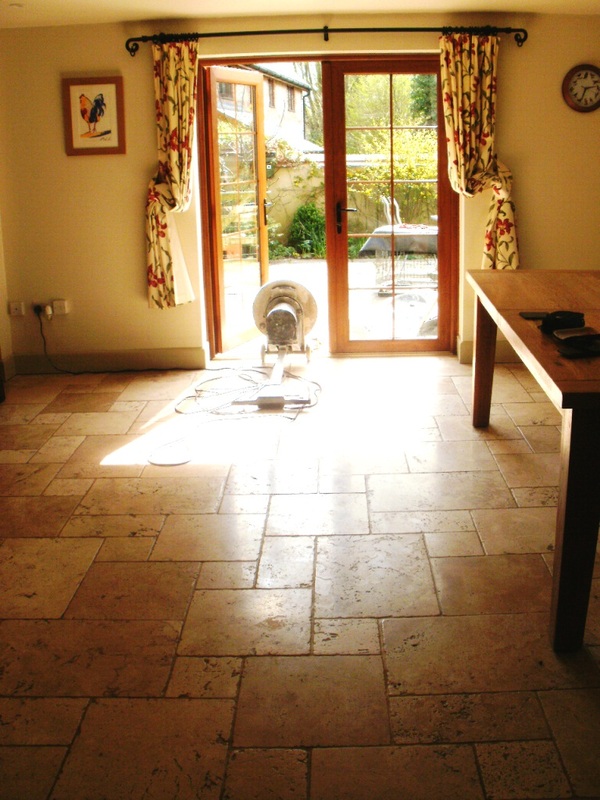 The floor hadn’t been professionally cleaned for some time and was now dirty and suffering from the actions of a puppy which likes to charge up and down. 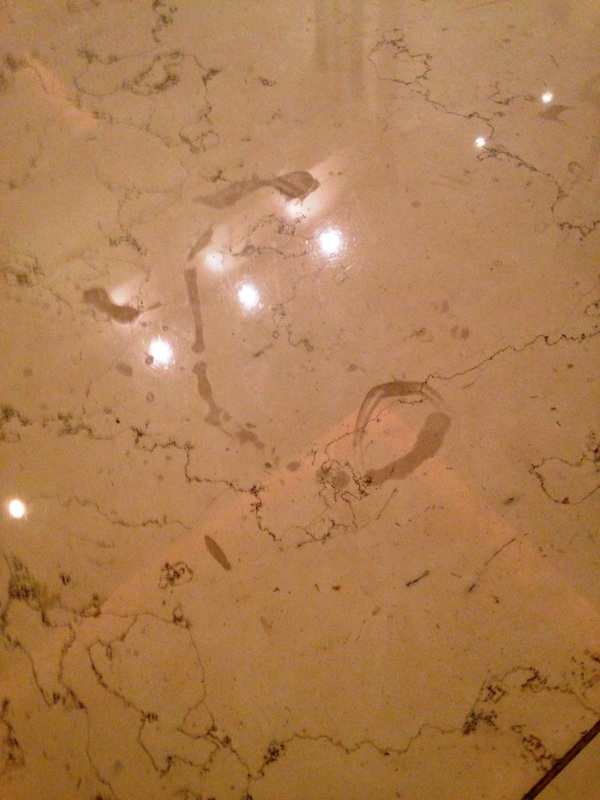 The Marble was also full of holes which the client explained had been getting larger. 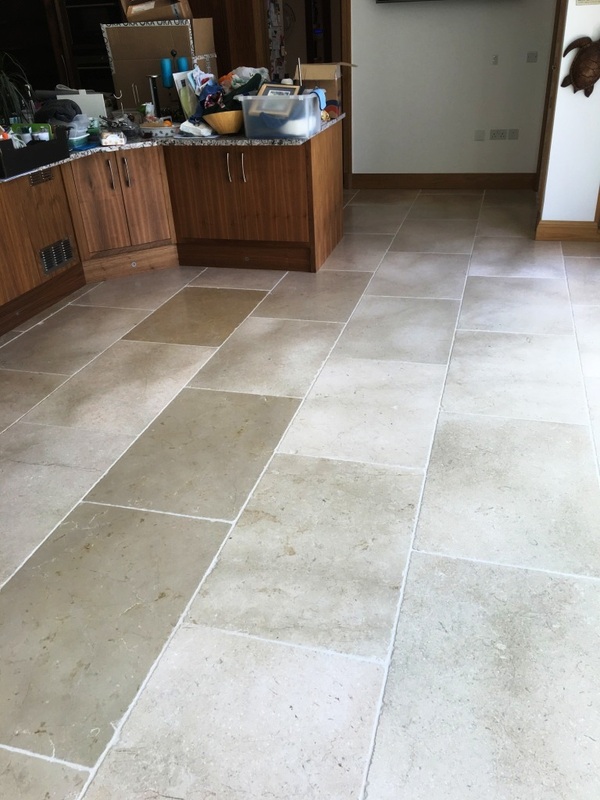 This is not usual for natural stone as it can be very sensitive to acidic cleaning products which if used constantly over time will start to dissolve the stone. We discussed the remedies available, agreed a cost and arranged a mutually convenient time to carry the work out. 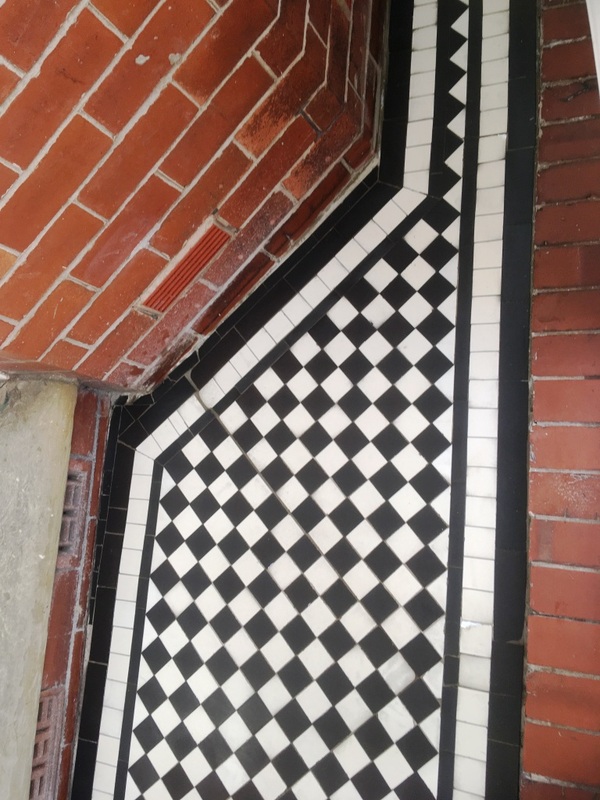 I always like to do a site visit to survey the tiles and ideally run a test clean to determine the best methods for resolving the problems. 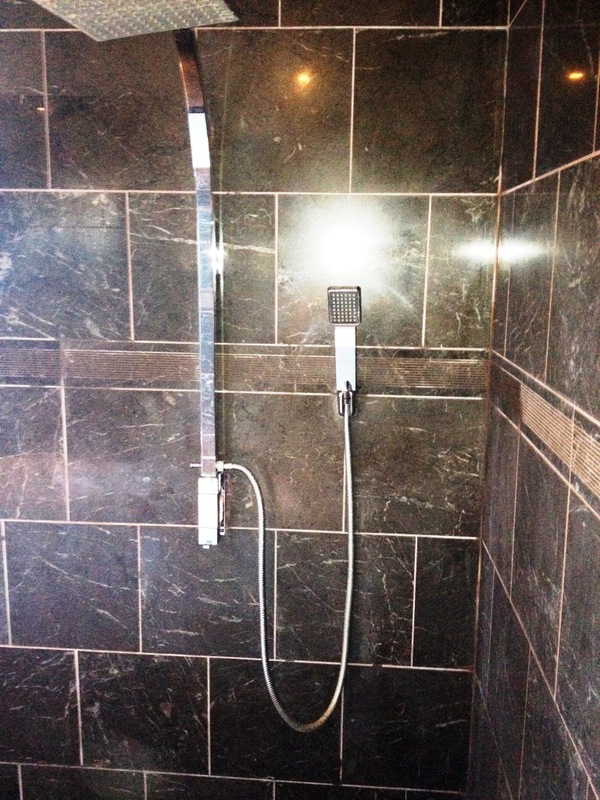 This enabled me to give a more accurate quote and it also gives the customer confidence in my abilities. 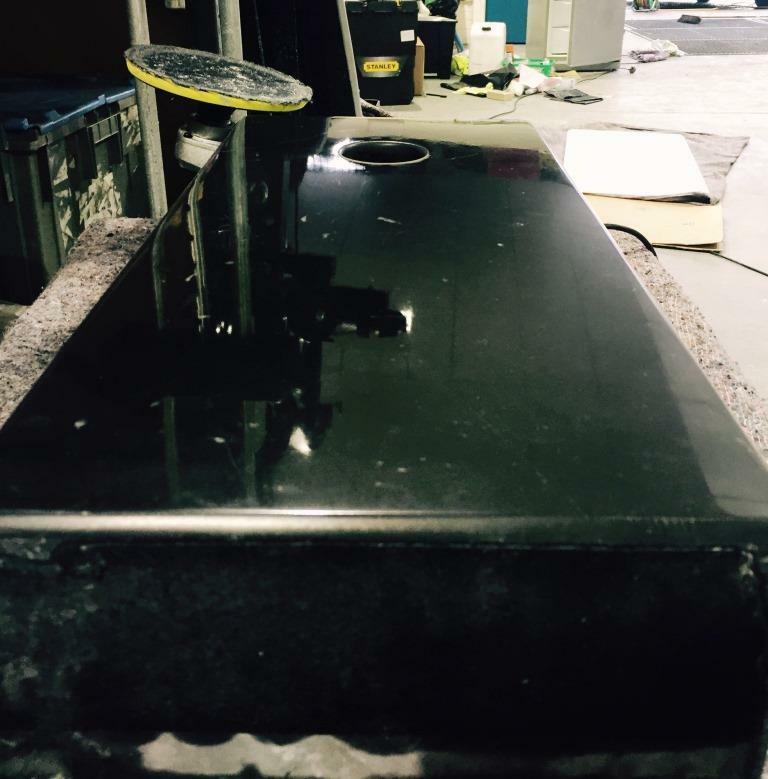 Firstly, I removed the existing sealer with a 400-grit diamond burnishing pad which is applied with water. 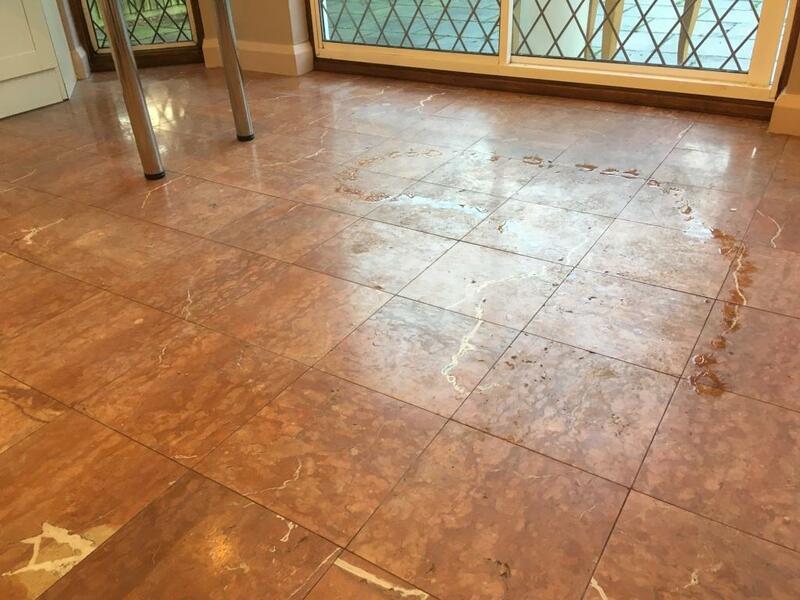 Although this initially appears to make the floor look worse, this is only temporary, sometimes you have to make it look a little worse before it can get better! 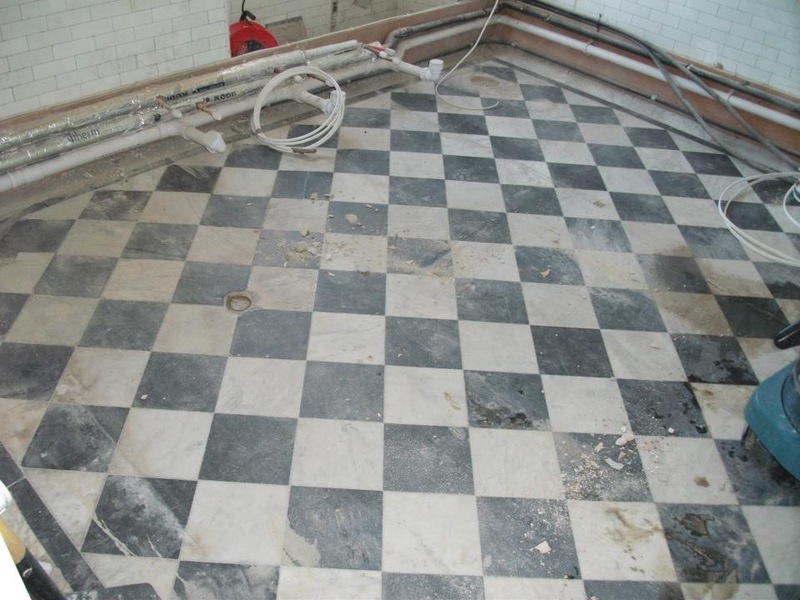 Once this was done the floor was rinsed with water to remove the slurry generated and this was then extracted off the floor with a wet vacuum. Then for the next couple of hours I worked my way from the back door to the front filling all holes with a special expanding resin, then smoothing off as I went to ensure the smoothest of finish could be achieved. Some of the holes were indeed quite large, so there was quite a lot of work to do. 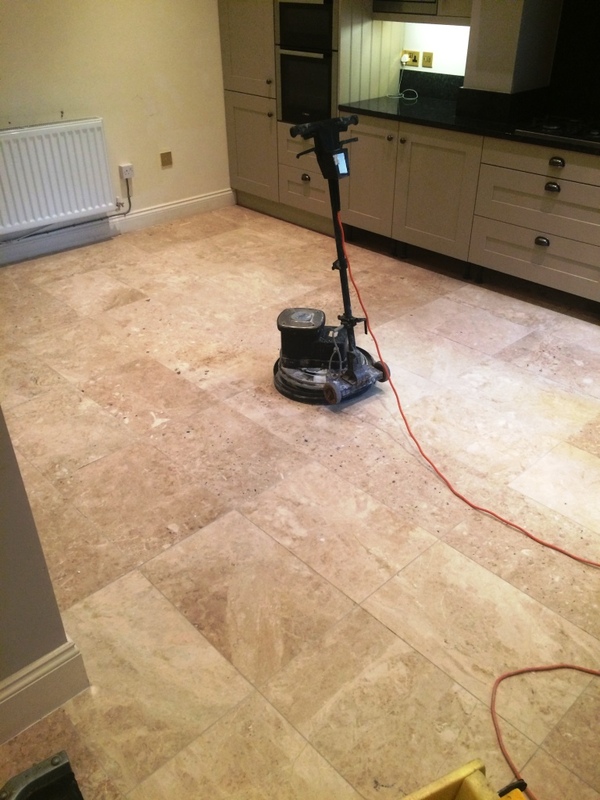 Once the filler had dried I started the polishing process using the 800 and then 1500 grit burnishing pads, once again with more water to lubricate and rinsing the floor in between polishing and removing the slurry as before. 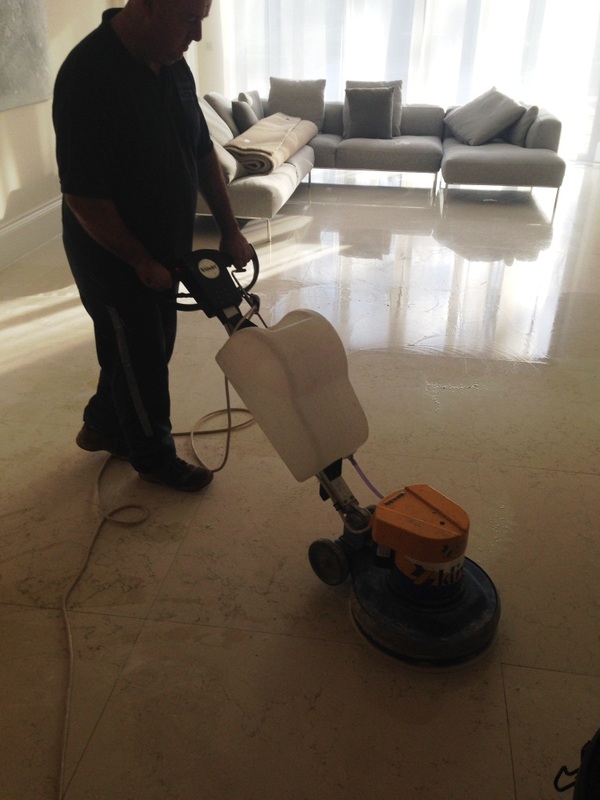 This process took much of the day, so I left the floor to dry off and came back the next day to complete the polishing and seal the Marble. 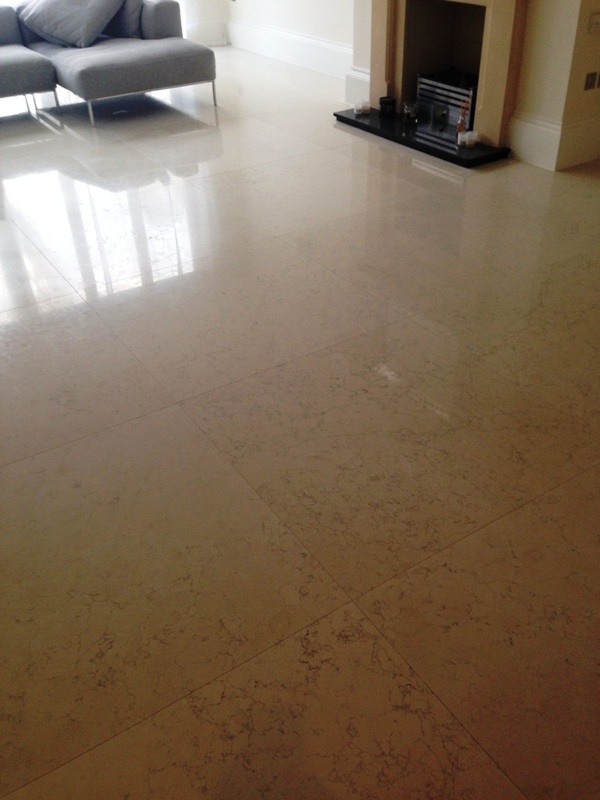 The next day I returned and completed the polishing process by applying the fourth burnishing pad which is an extra fine 3000 grit pad, you apply the pad dry with only a little amount of water sprayed onto the floor in process we call a spay burnish and this final pad really brings up the polish in the Marble. 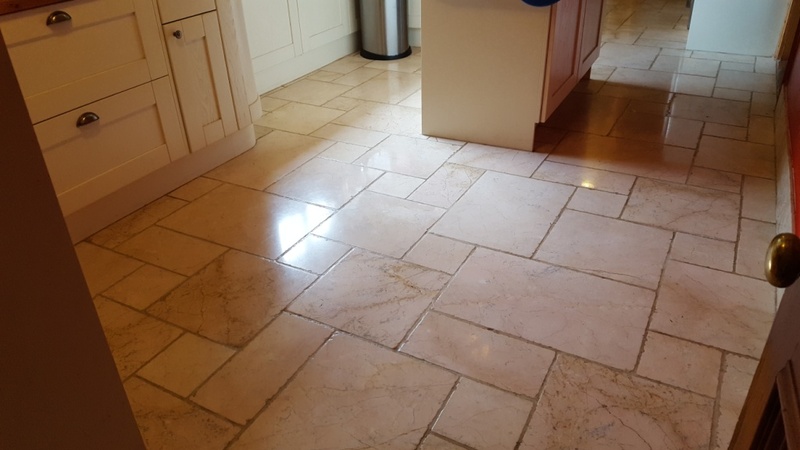 Once the polishing had finished I left the floor for a little while to make sure it was nice and dry and then I applied two coats of Tile Doctor Colour Grow sealer. 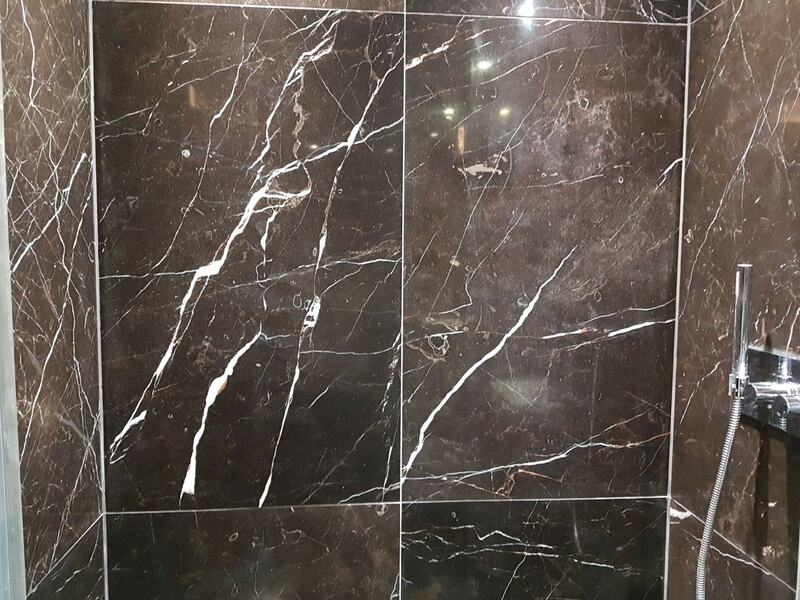 This is a colour intensifying sealer that provides durable protection by impregnating the pores in the stone with sealer, so dirt cannot become ingrained there. 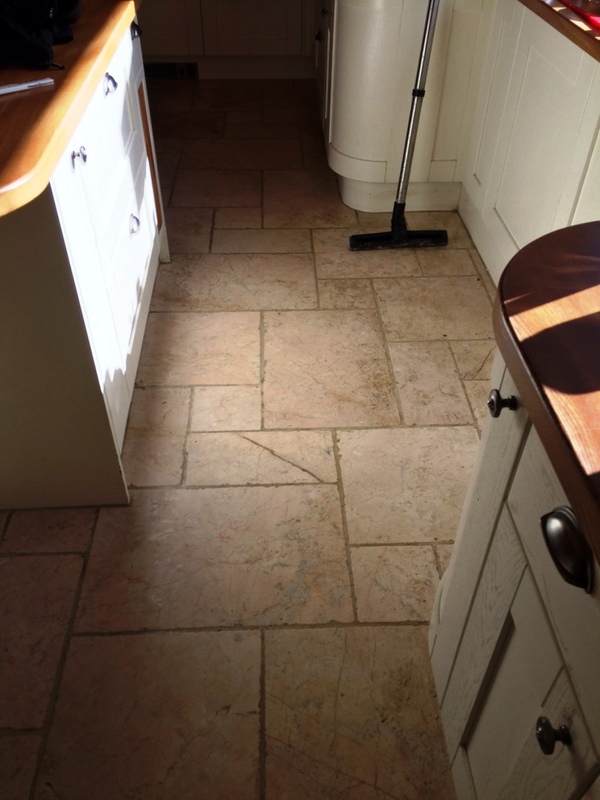 As you can see from the pictures the sealer dramatically enhanced the natural colours in the stone. 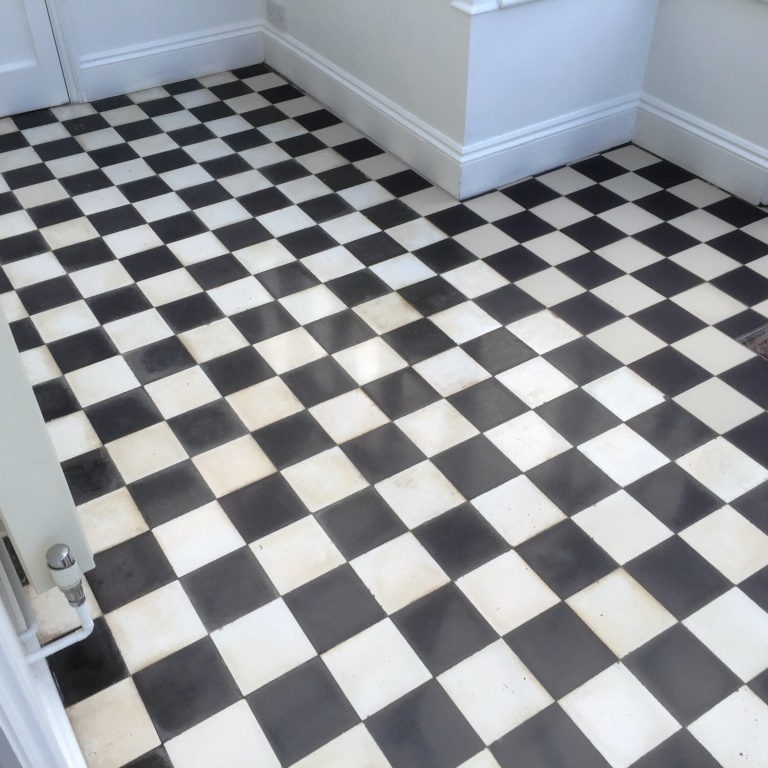 Once dry I backed my way out of the house with a final finishing polish using a white buffing pad to remove any excess sealant and bring up the sheen of the tiles even further. I left instructions with the client to keep off for a couple of hours while the sealer cured. 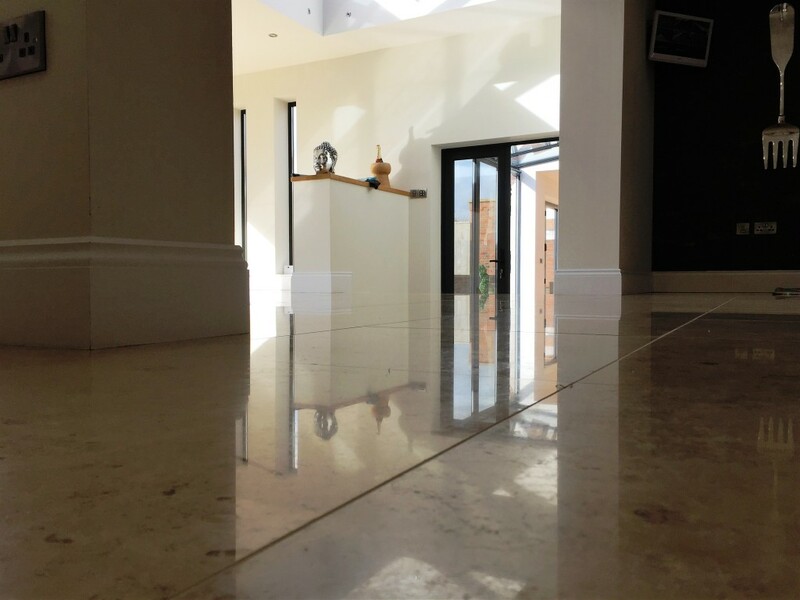 The client was over the moon with the end result, the floor was left shiny, protected and looking in a fabulous condition. 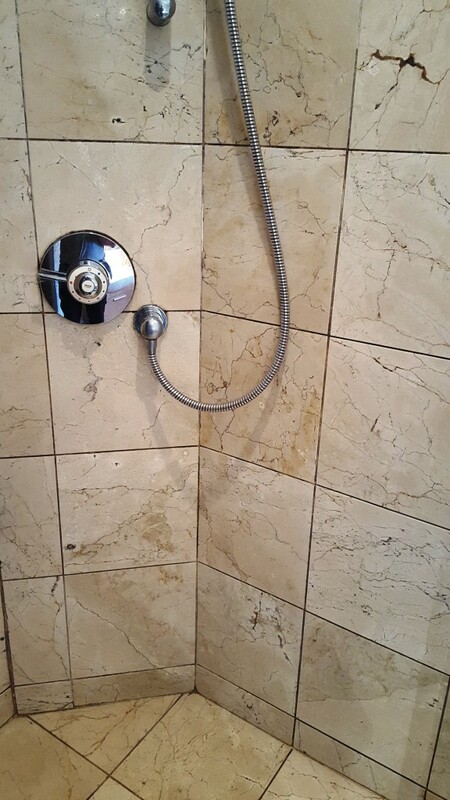 We recently received an enquiry from a customer in Ealing, East London who was concerned about their Marble Tiled Shower which had been damaged from the use of Viakal Limescale Remover. Unfortunately, this is a very common problem and we often receive calls from customers with similar issues. 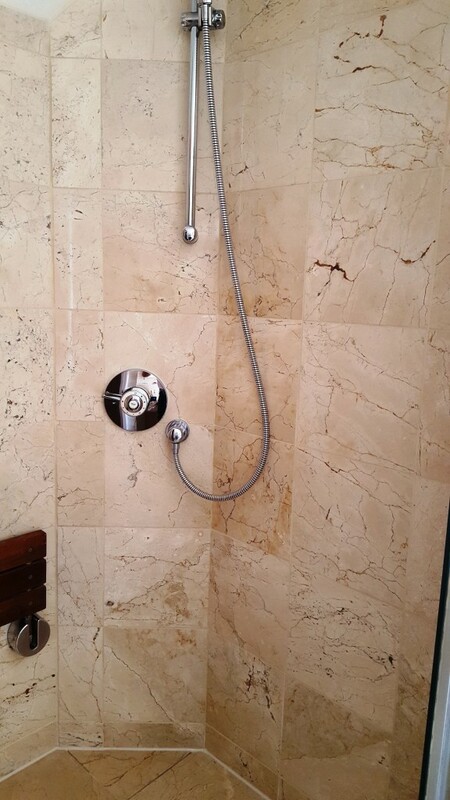 Limescale removal products such as Viakal and Cillit Bang are very effective but like any acidic product, they are very harmful to natural stone such as Limestone and Marble. 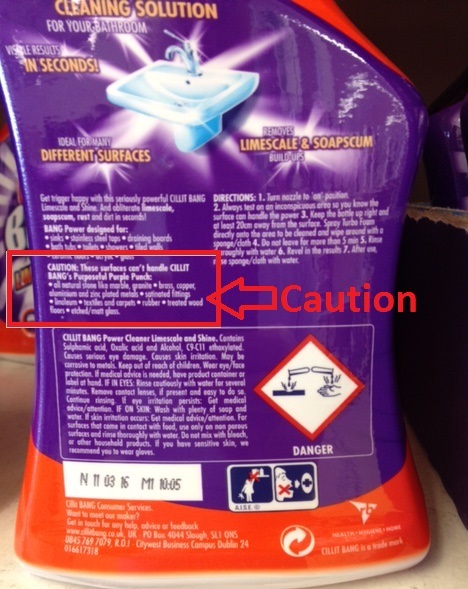 With any cleaning product you should really read the label before use and in this case you will find they state the product should not be used on natural stone. 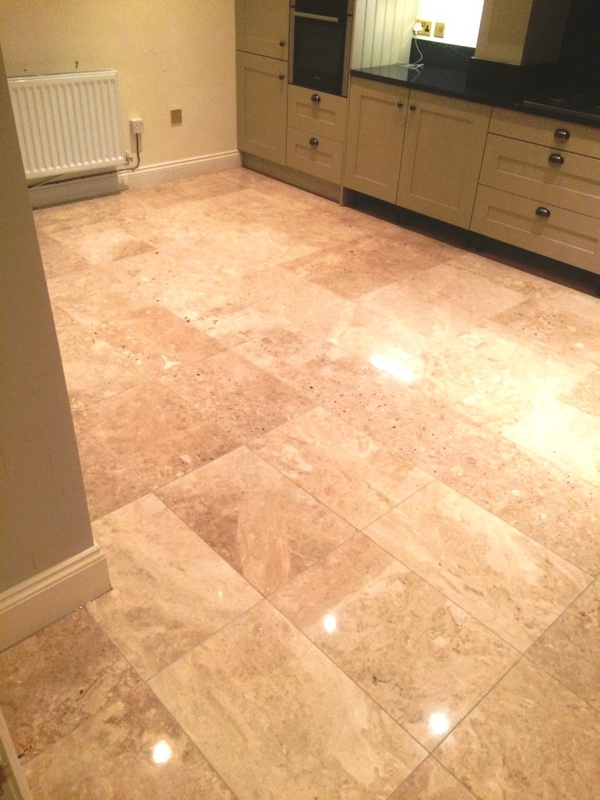 Marble tiles can be tumbled in large drums to achieve an aged and softened effect, and this can look very nice providing that the stone is adequately maintained. 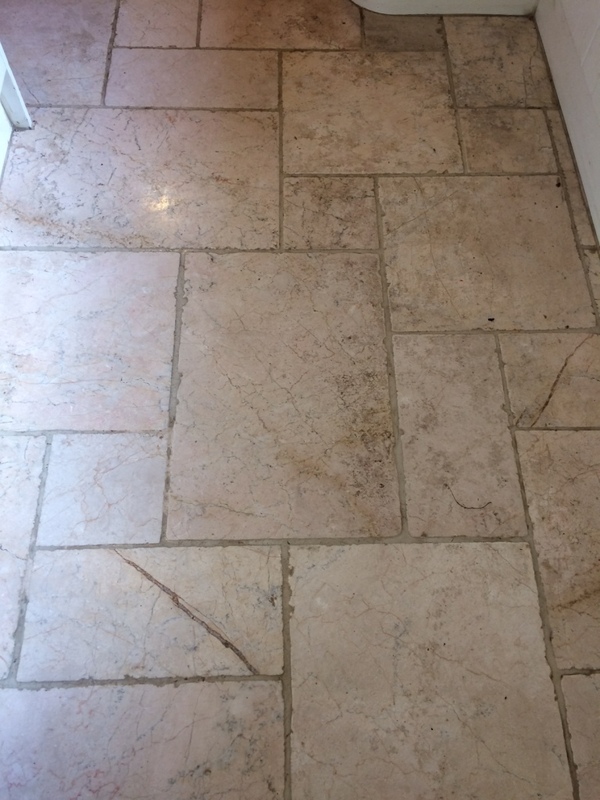 In the case of this floor at a property in Twickenham South West London, the Marble tiles that had been laid over five years ago, and in that time the sealer had worn down offering the floor little protection. 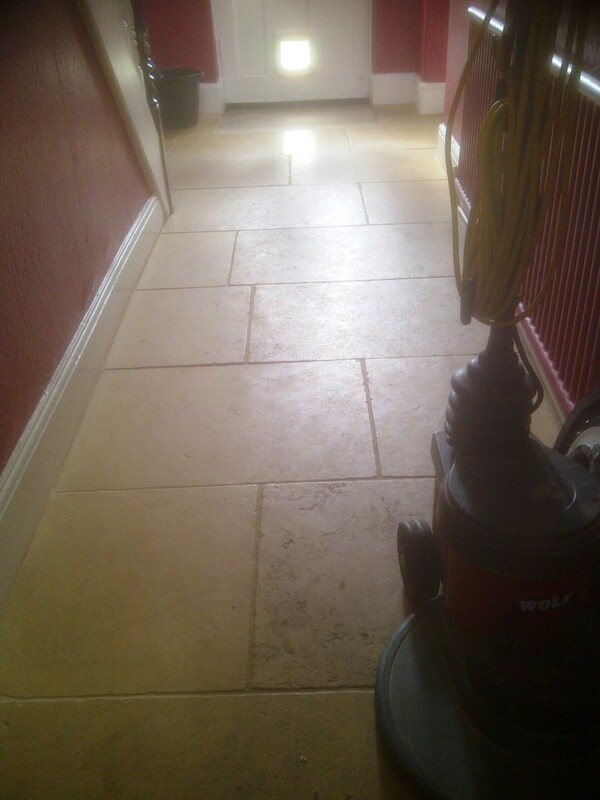 Dirt had now become ingrained in the pores of the stone and grout, and a deep clean and fresh seal were required to restore the stone’s original colour and lustre. The property owner asked me to complete the job and I was more than happy to oblige. 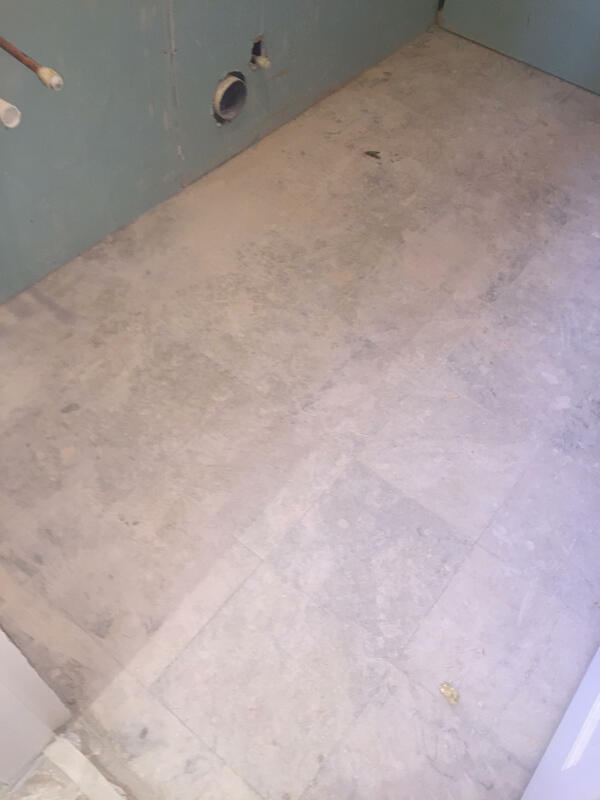 To begin the restoration, I applied both Tile Doctor Pro-Clean, which is a high alkaline cleaner, and Tile Doctor Remove and Go, which a heavy-duty stripper and remover, to the floor and scrubbed the products in using a scrubbing pad fitted to a professional rotary machine. 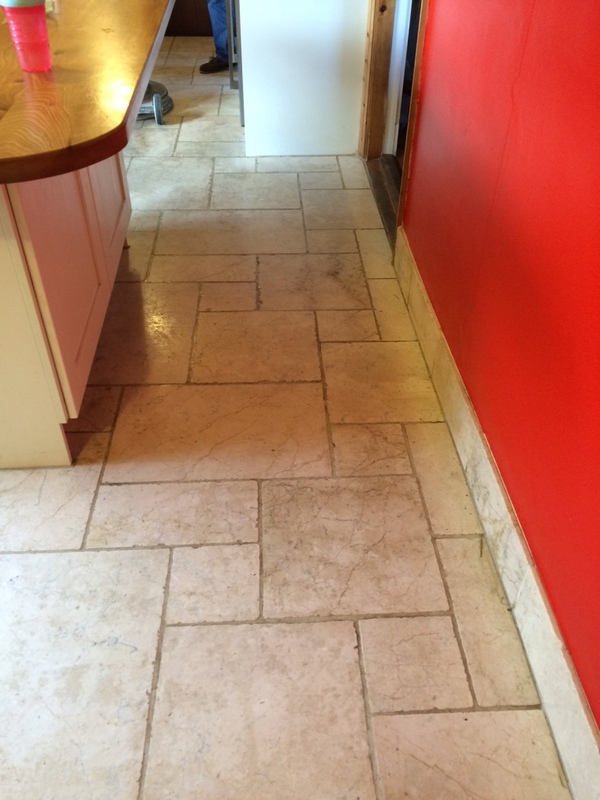 The chemical solvents in the Remove and Go helped to break down any old sealer that remained inside the stone, allowing the Pro Clean to then work its magic on the stubborn ingrained dirt the customer had struggled to remove previously. 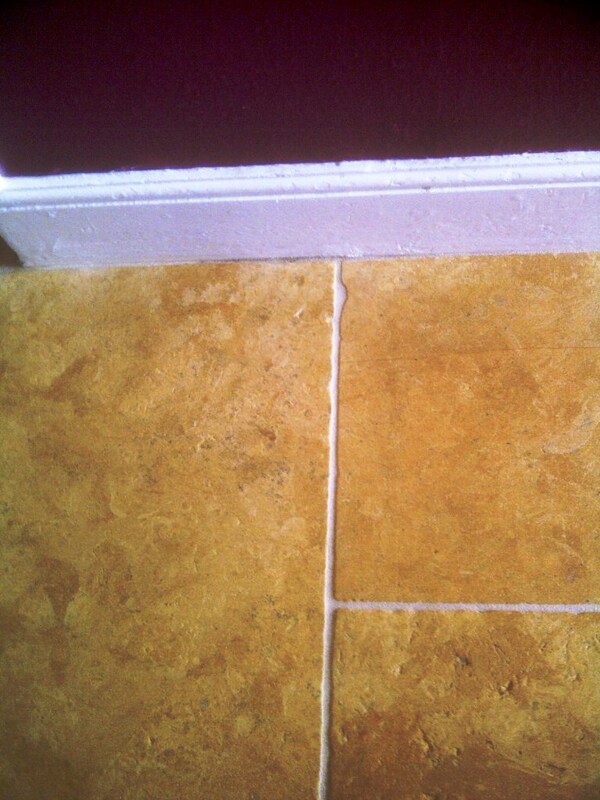 Some of the deeper veins and grout lines I chose to scrub by hand to ensure the fullest and most meticulous clean possible. 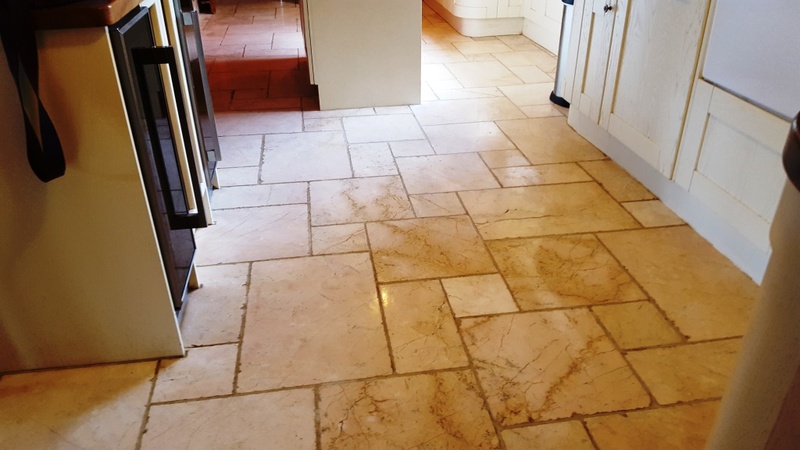 The resulting soiled cleaning solution was then pressure rinsed with water and the soil extracted with a wet-vacuum, leaving a completely clean floor that was now ready to be sealed using a new sealant. 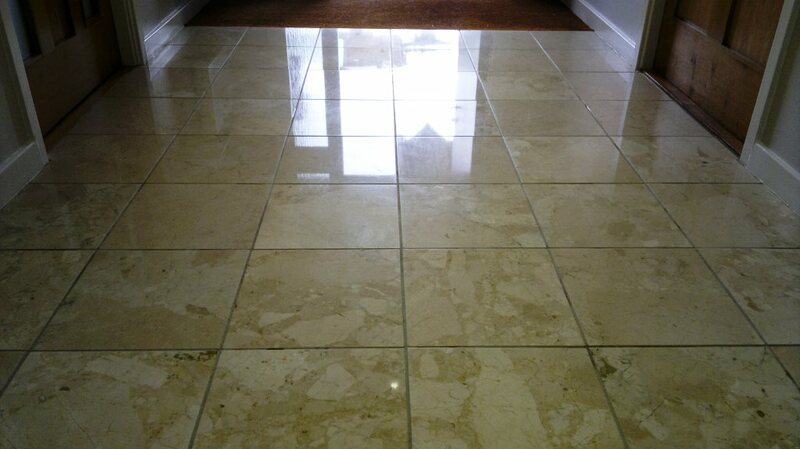 I returned to the property the following day after allowing the Marble tiles to dry fully. 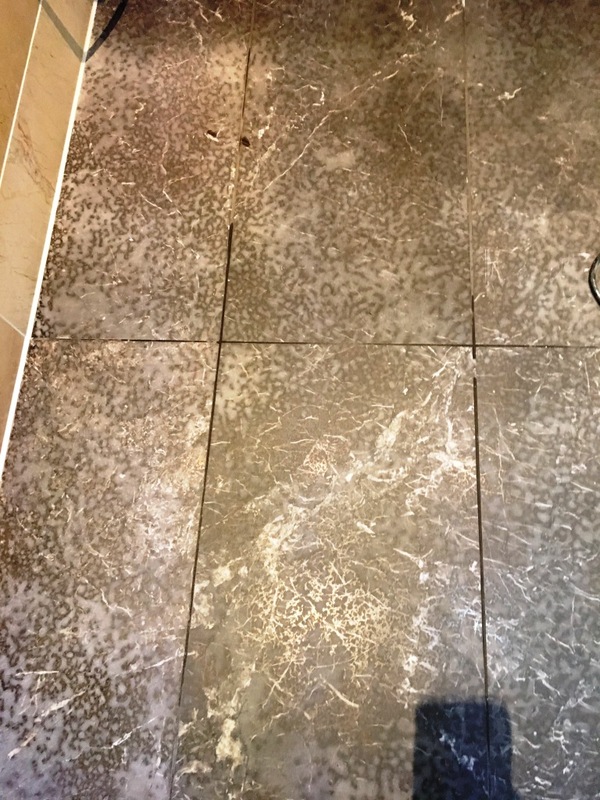 Drying the tiles is a crucial part of the restoration process, since even a small quantity of excess moisture can cloud the sealer and prevent it from working to its fullest capabilities. 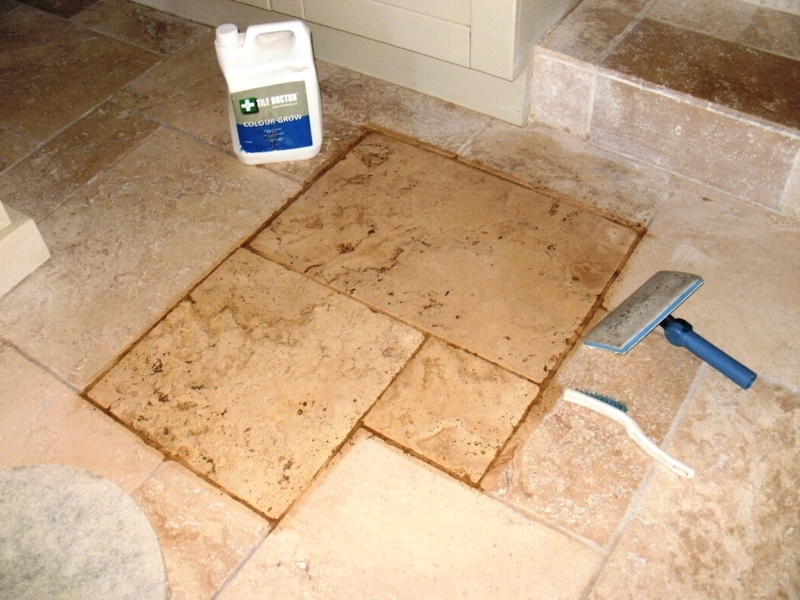 I applied two coats of our solvent-based impregnating sealer known as Tile Doctor Colour Grow. 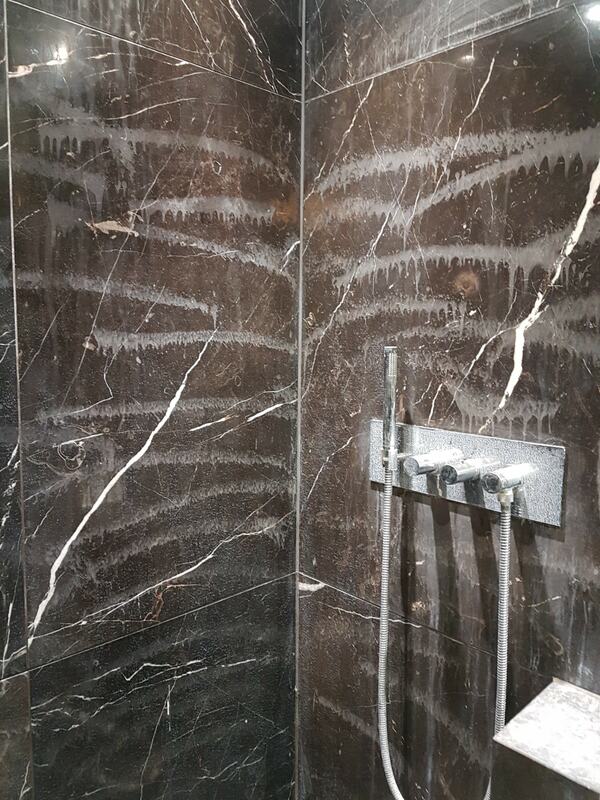 As the name of the product suggests, Colour Grow not only protects the tiles against ingrained soil, it also thoroughly lifts and enhances the natural colours in the stone. 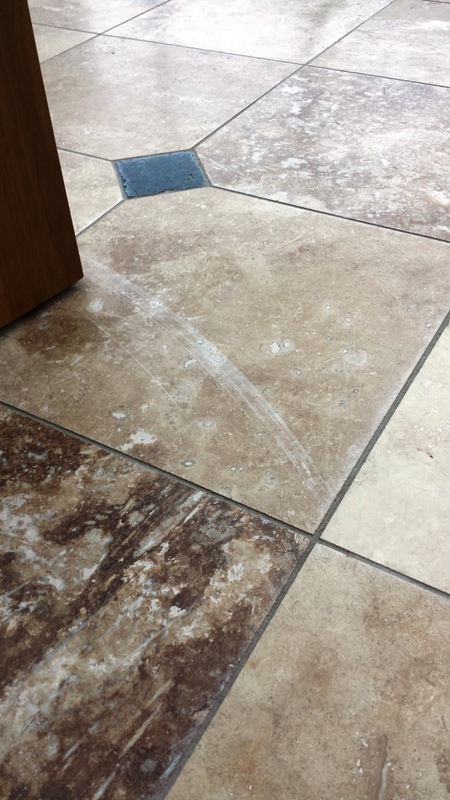 The new seal will make it easy for our customer to maintain the floor, making daily cleaning easier. 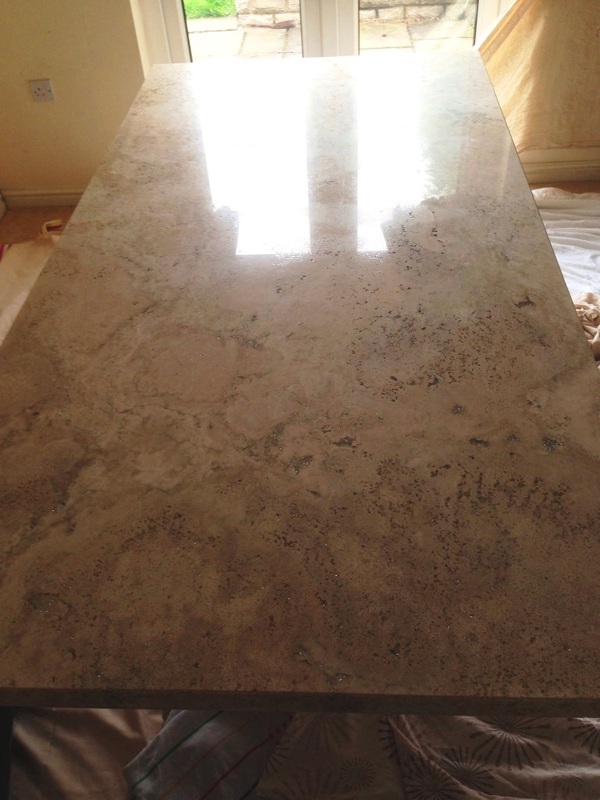 It will also protect the stone against the nasty spillages that are common in kitchens and living rooms. 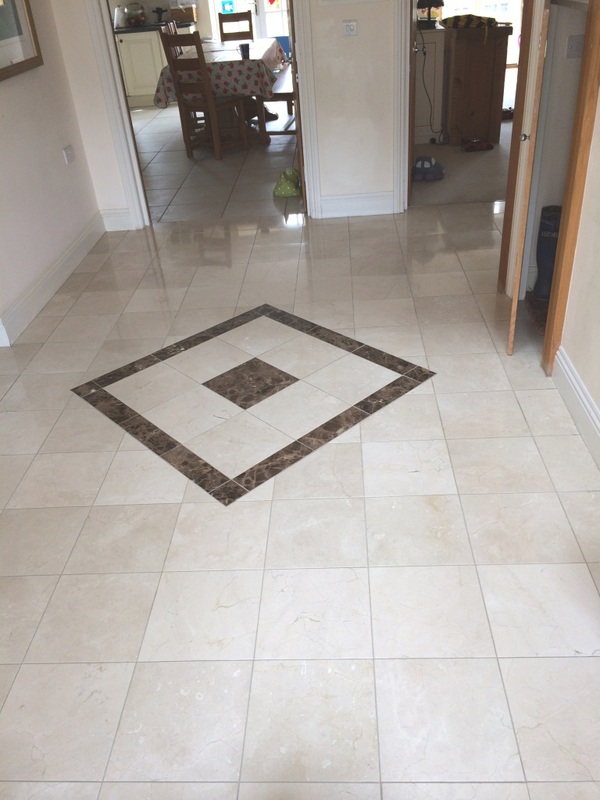 The customer was thrilled with the much-improved appearance of the Marble tiles and is very reassured that they will now stay in great condition for a long time. 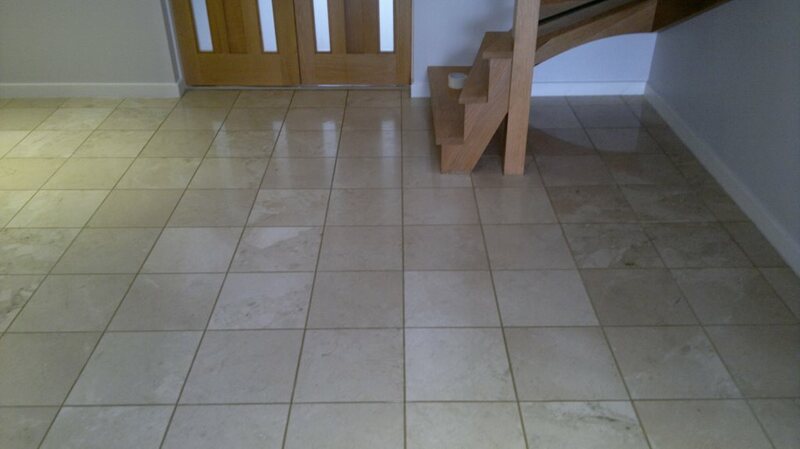 Another satisfied client! 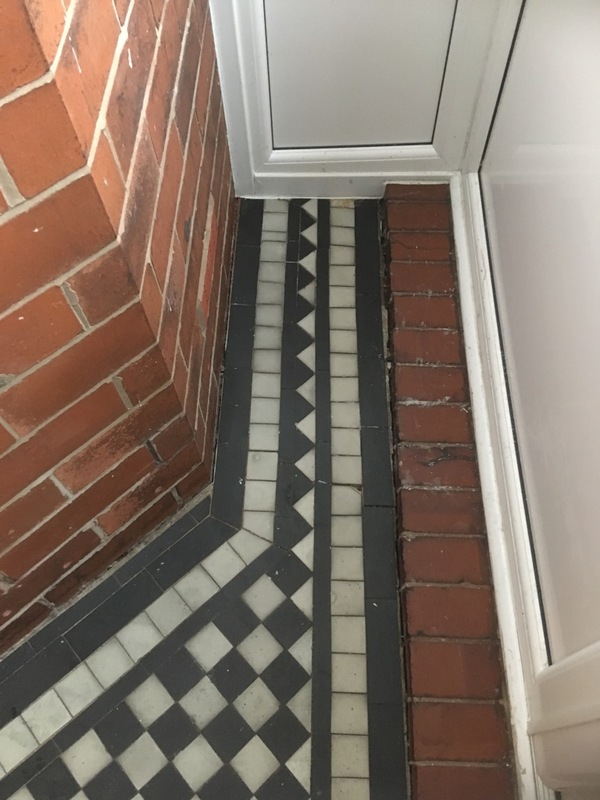 A fantastic Marble tiled entrance hallway is the first thing you see when you open the door to this property in Congleton. 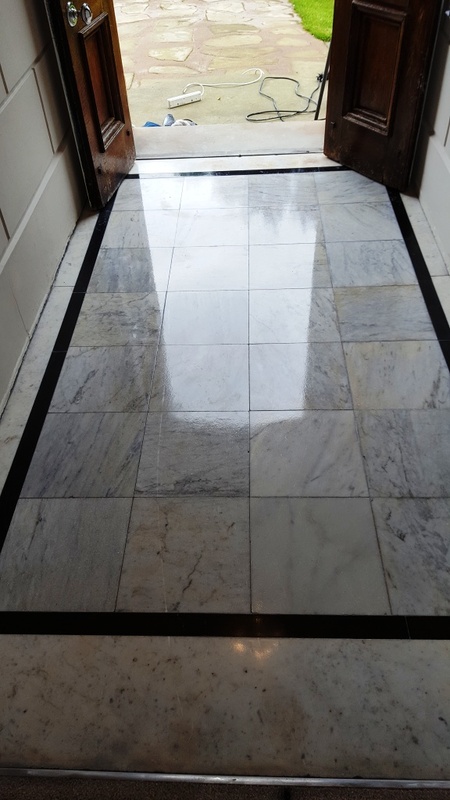 Unfortunately, polished stone does need regular maintenance to keep its appearance, especially in high traffic areas such as this vestibule which had lost their shine, leaving them looking dull and unexceptional. 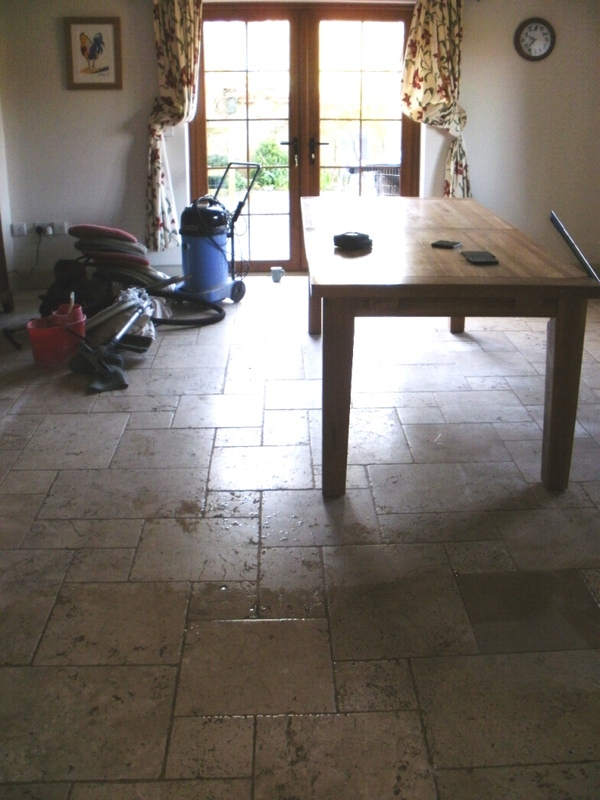 Needless to say, the property owner was keen to get the floor restored to its former glory. 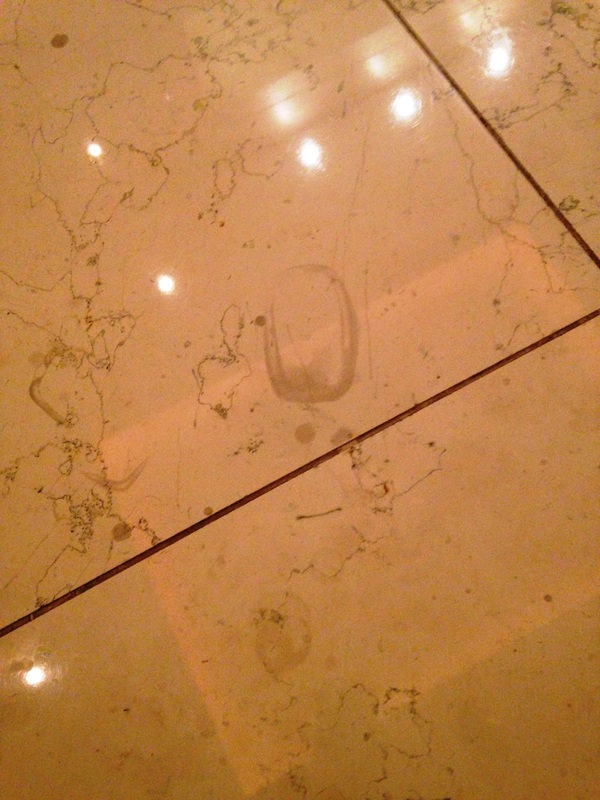 That’s where I stepped in. 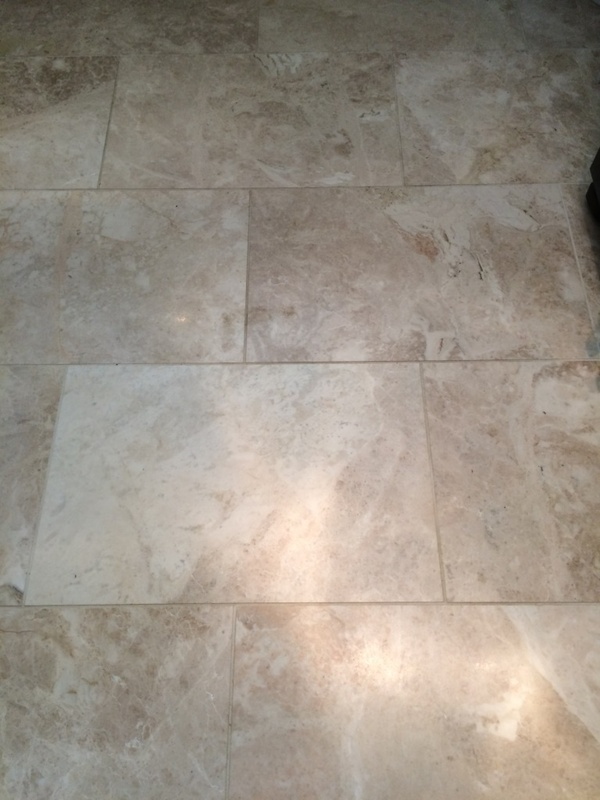 There was no evidence of old sealers present on the floor, so I started deep cleaning the tiles and grout lines using a solution of Tile Doctor Pro Clean mixed with clean water. 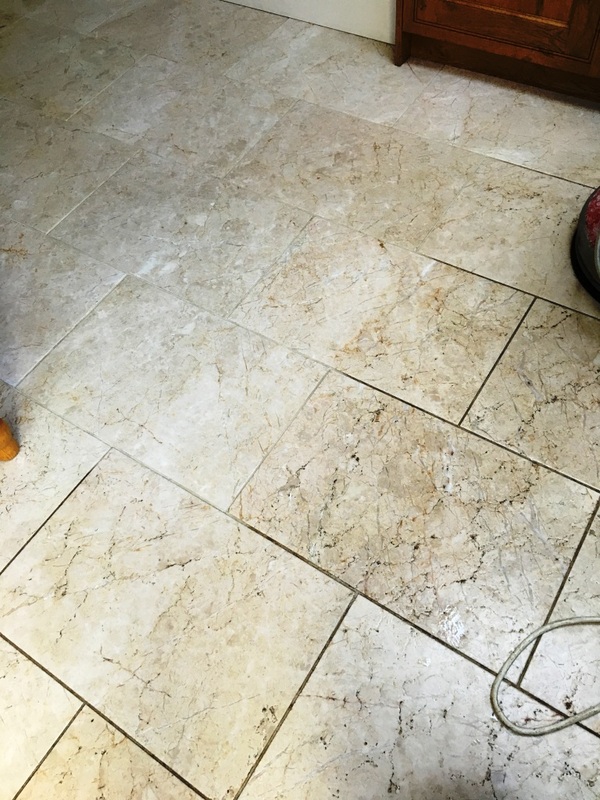 A quick word on cleaning here, as an alkaline-based cleaner, Tile Doctor Pro-Clean is suitable for use on natural stone floors, including acid-sensitive stone such as Marble and Limestone. 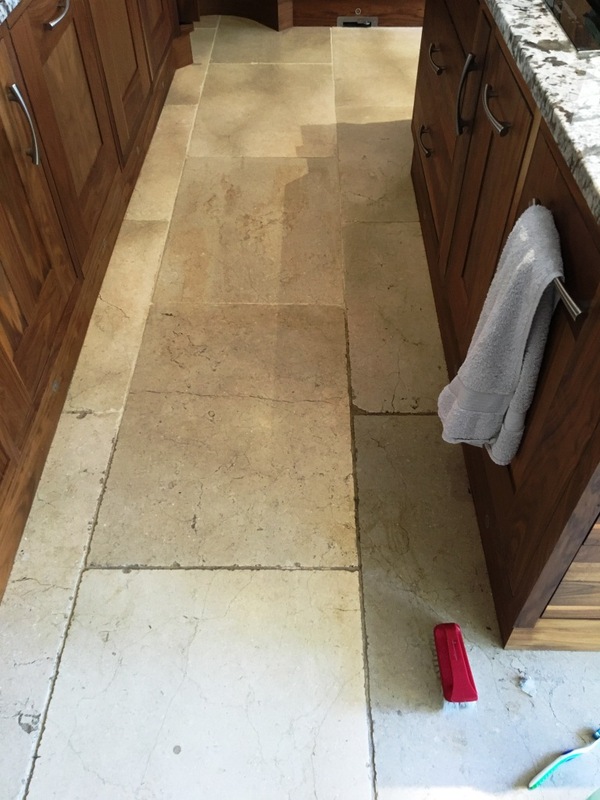 Many everyday household cleaners from the supermarket are acidic, which will erode the life of the sealer and a strong acid can etch the surface of sensitive stone, so make sure to source the correct cleaning product to avoid this problem. 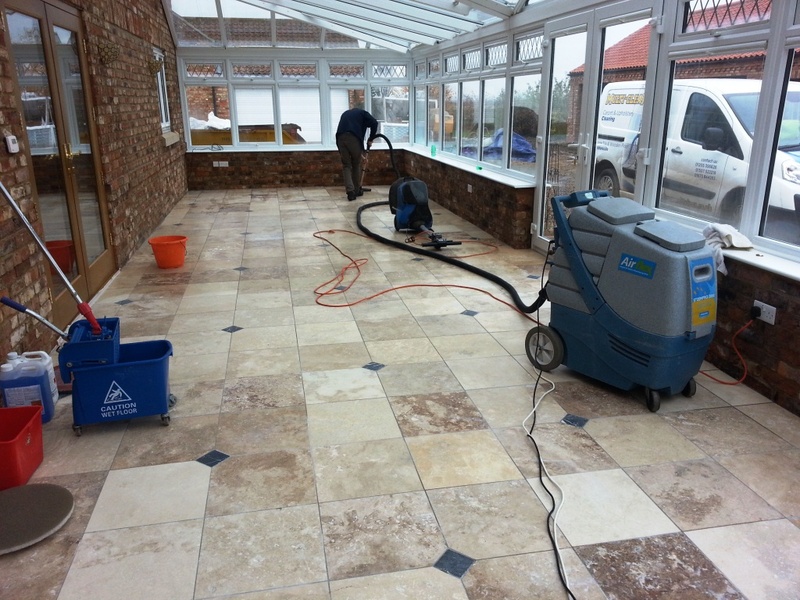 The cleaning solution was left to soak into the tiles for ten minutes before being worked in to give a thorough clean using a rotary machine fitted with a scrubbing pad. 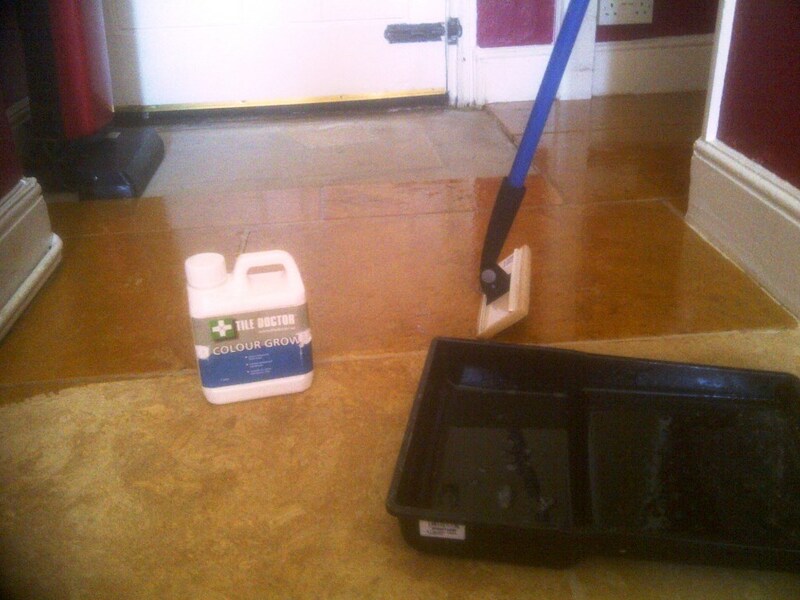 The soiled cleaning solution was then removed with a wet vac machine, and the floor washed down with clean water. 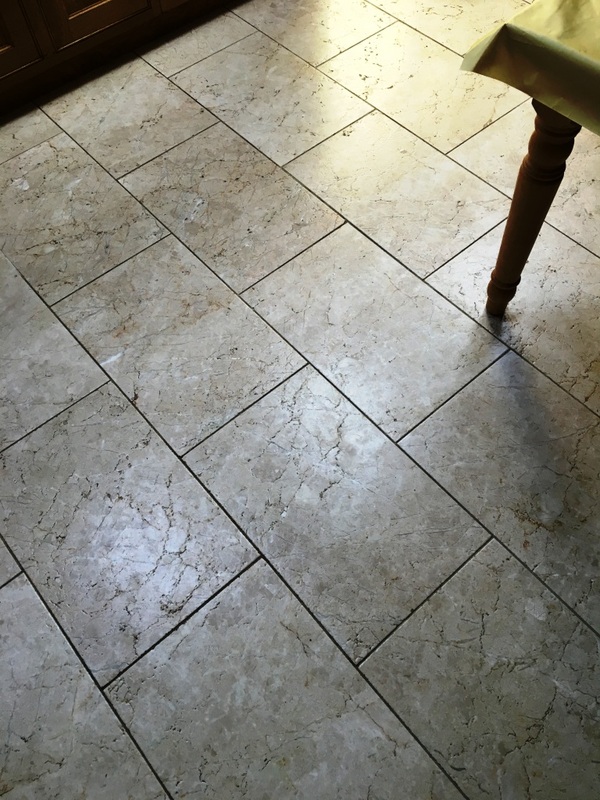 The next step in the restoration was to restore the polish on the surface by burnishing the floor using the Tile Doctor four pad burnishing pad system. 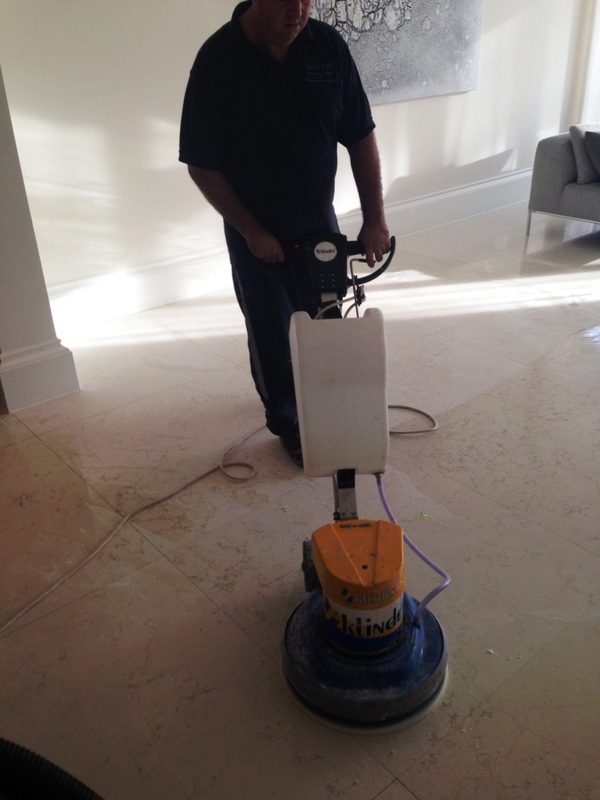 This involved the application of a set of diamond encrusted burnishing pads fitted to a floor buffing machine. 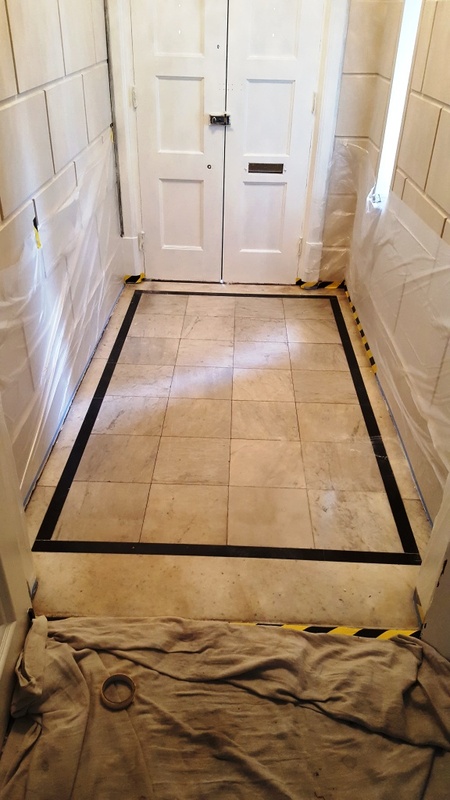 Each of four the pads are used in sequence from the coarse 400 grit pad through to the 3000 grit extra Fine pad applied in sequence with a little water to lubricate and giving the floor a rinse in-between each pad to remove the slurry. 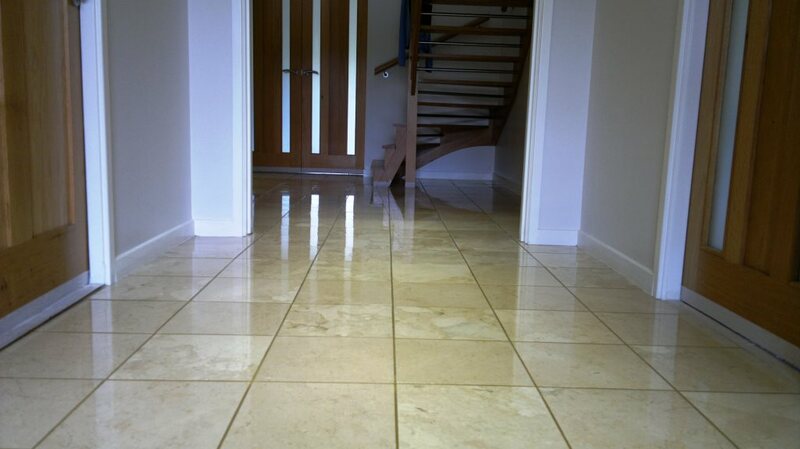 To finish off the restoration, I proceeded to seal the floor using Tile Doctor Shine Powder, a sealer in crystallised powder form which increases the polish and durability of the floor which is especially useful in a high traffic area..
Once I had polished off the excess, the floor had an exceptionally high shine and a robust, durable surface. 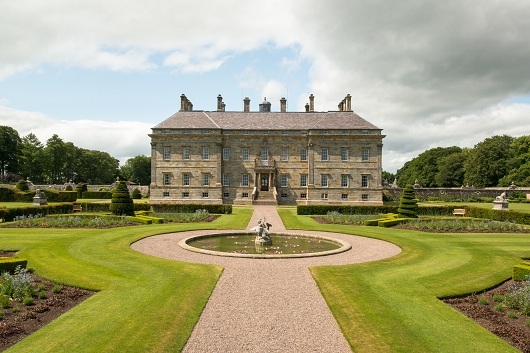 Now that the entrance hallway has been completely restored it is a real asset to the house. 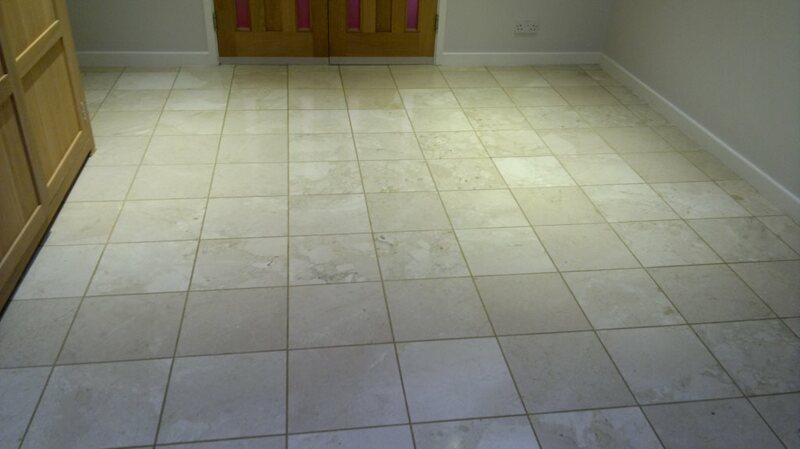 The customer was very happy with the result and will surely be showing off these beautiful Marble tiles to their guests. 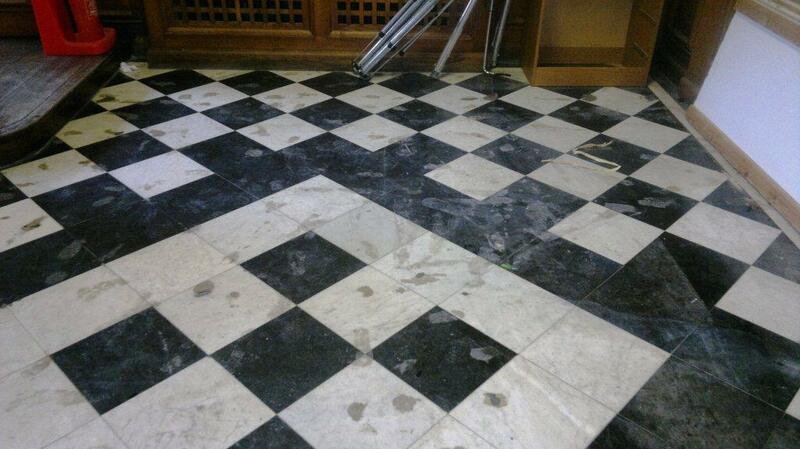 At this property in Fife, I was asked to restore not a tiled floor, but in fact a solid black Marble lamp base. The lamp base was particularly by scratched and damaged as a result of a lack of care and consideration by a removal company. It’s a shame to see such a high-quality item suffer this kind of damage; nonetheless, I was keen to help with restoring it back to looking its best. I arranged to collect the base the next time we were working in the area of Fife, a historic area of Scotland which houses St. Andrew’s, one of the world’s oldest universities. The customer and I agreed that I would drop it back a week later following the restoration. 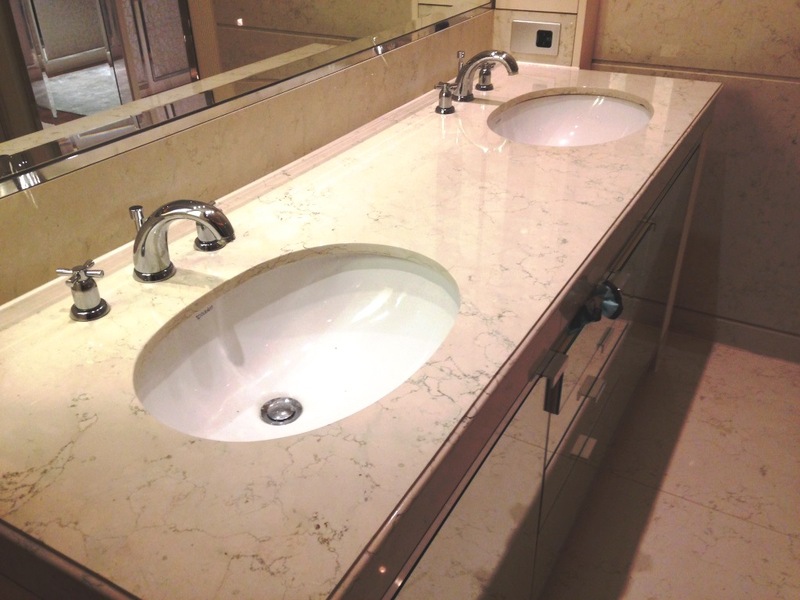 Restoring the appearance of the Marble (and other high-end stones such as Limestone) commonly requires a process known as burnishing. 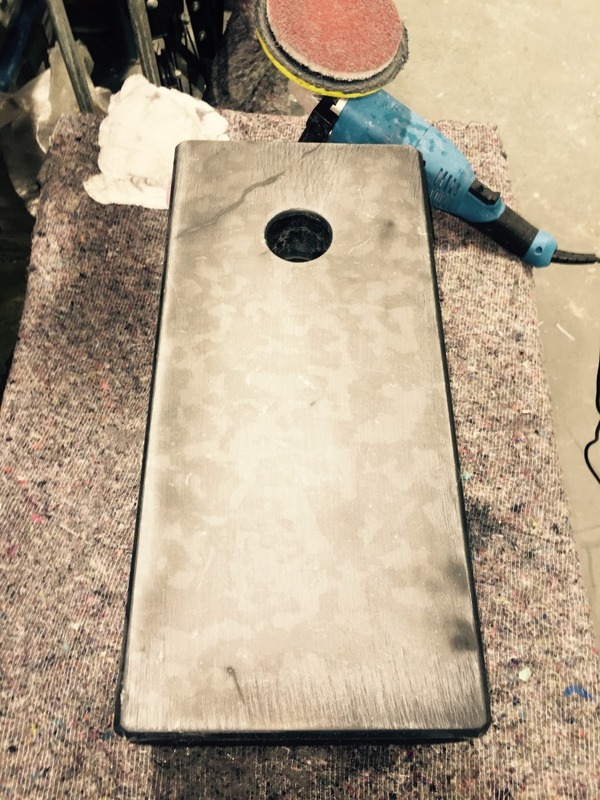 To begin, we applied to the base the first of a set of four six-inch burnishing pads. 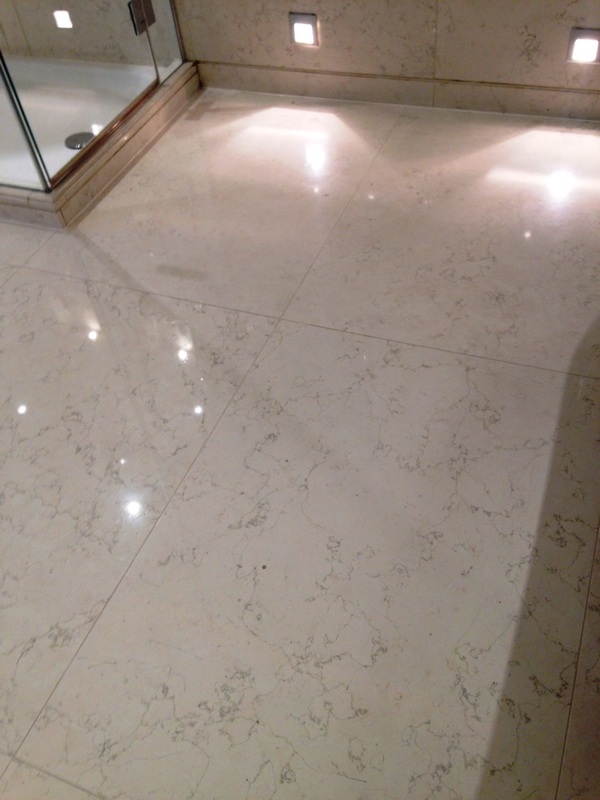 This pad, which had a Coarse grit, was fitted to a small handheld buffing machine and used to burnish the Marble with a little water for lubrication. 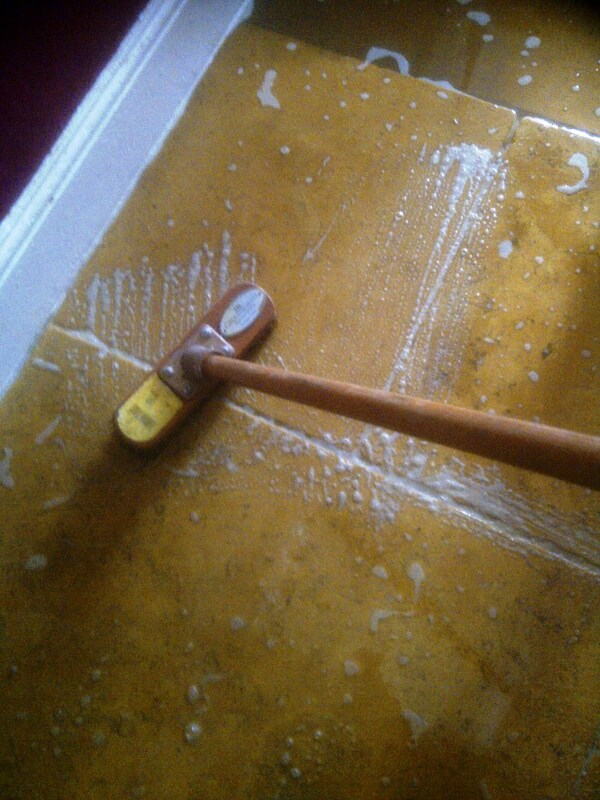 I then worked my way through the pad system to apply Medium, Fine and Very Fine grit burnishing pads. 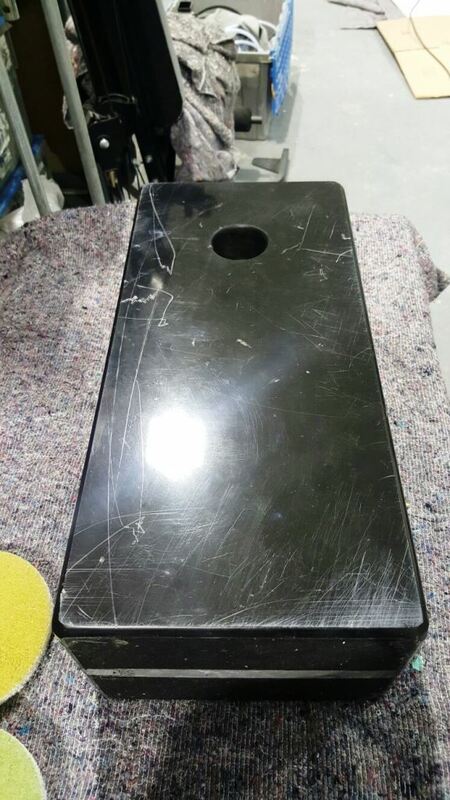 The process gradually improved the appearance of the base, managing to remove some of the lighter scratches; however, it became clear that more work was required to fully complete the restoration. 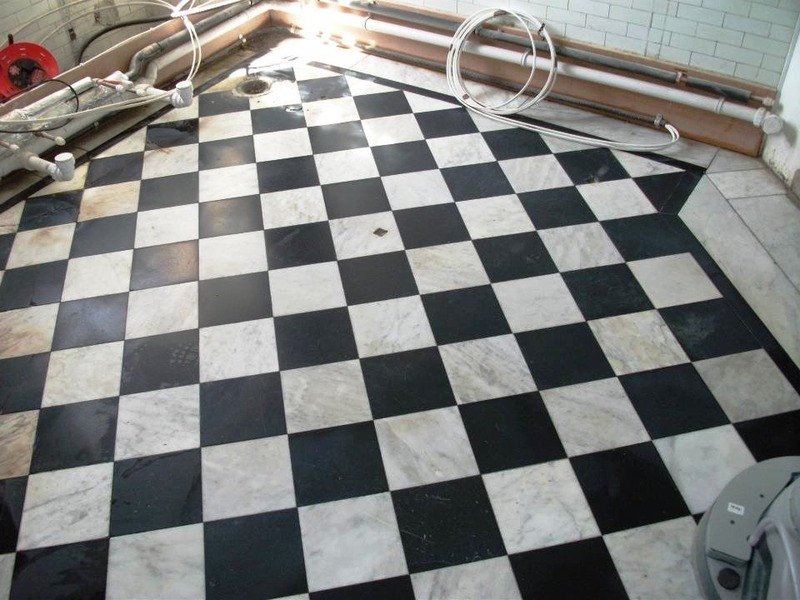 To take the restoration process a step further, I went on to use a set of four diamond encrusted hand burnishing blocks, which were applied to the Marble in a similar way to the previous stage. I followed up with another application of the six-inch burnishing pads: a process I’m happy to confirm successfully removed all scratches. 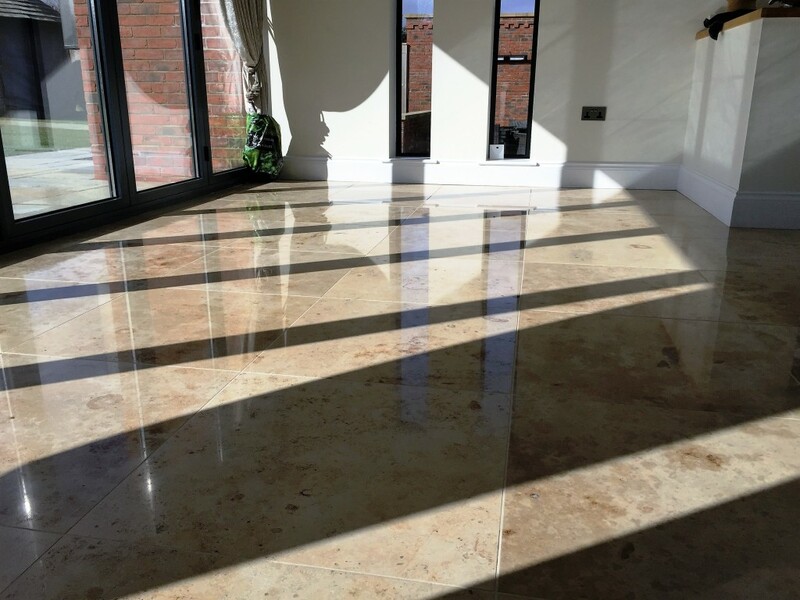 The base was then given a final polish and sealed using Tile Doctor Shine Powder (a sealer in the form of a crystallising powder) to seal the stone and provide the extra gloss look shine and durable finish requested by the client. 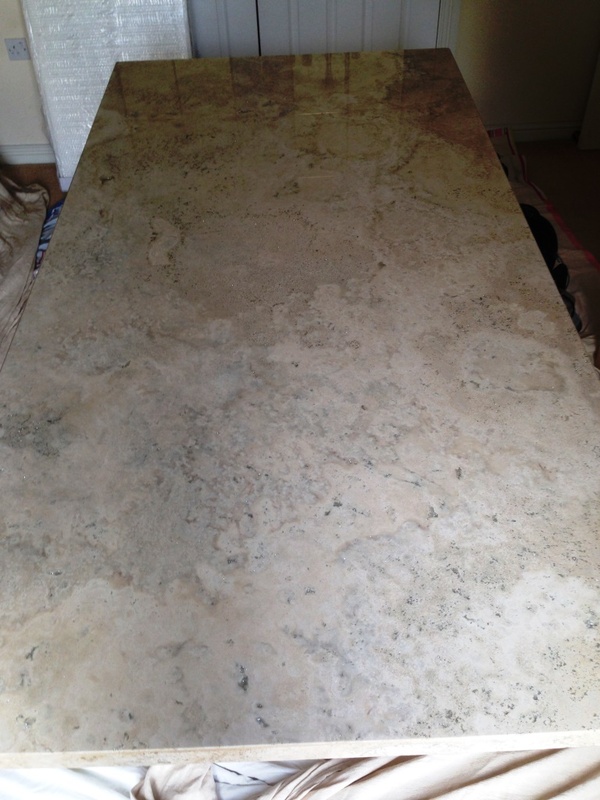 The customer was delighted with the results when I returned the Marble lamp base a week later. 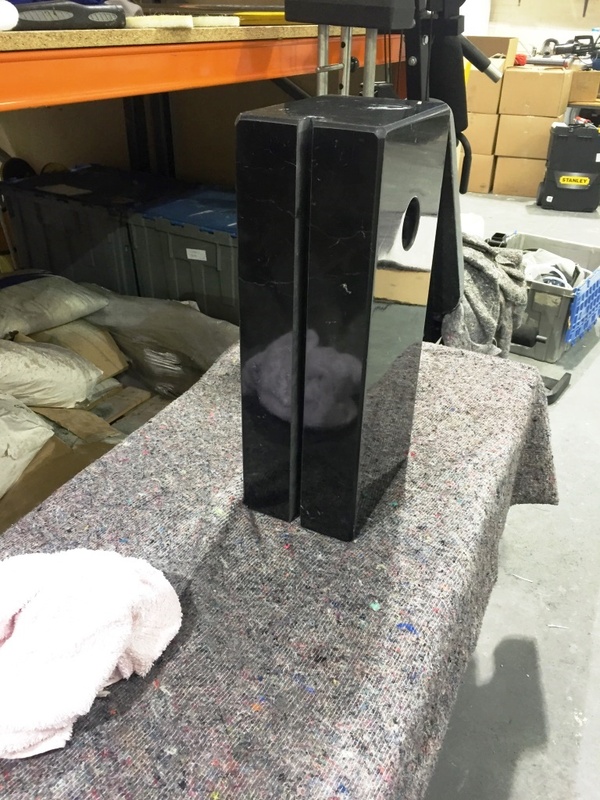 While it’s unfortunate that the base was damaged so badly to begin with, it’s certainly comforting to know that these valuable stone objects can be restored fully with the right methods. 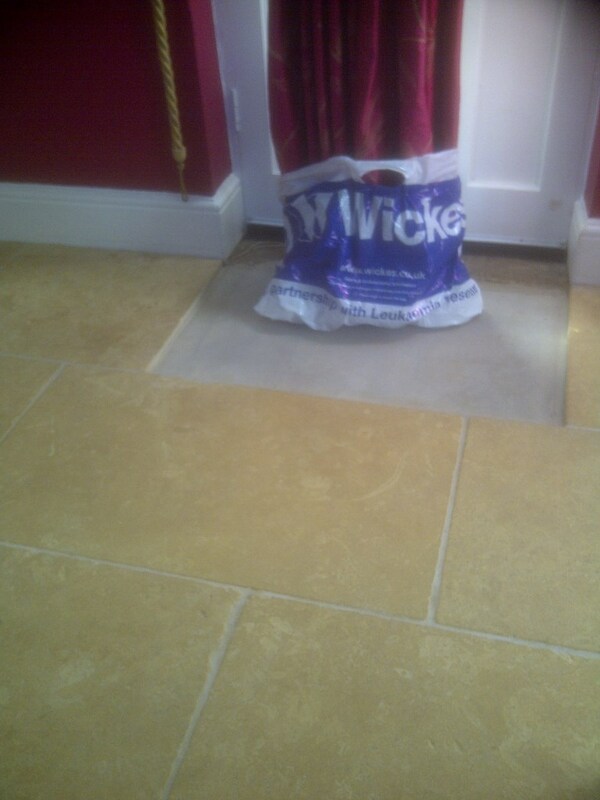 Never judge a tiled floor by its appearance! 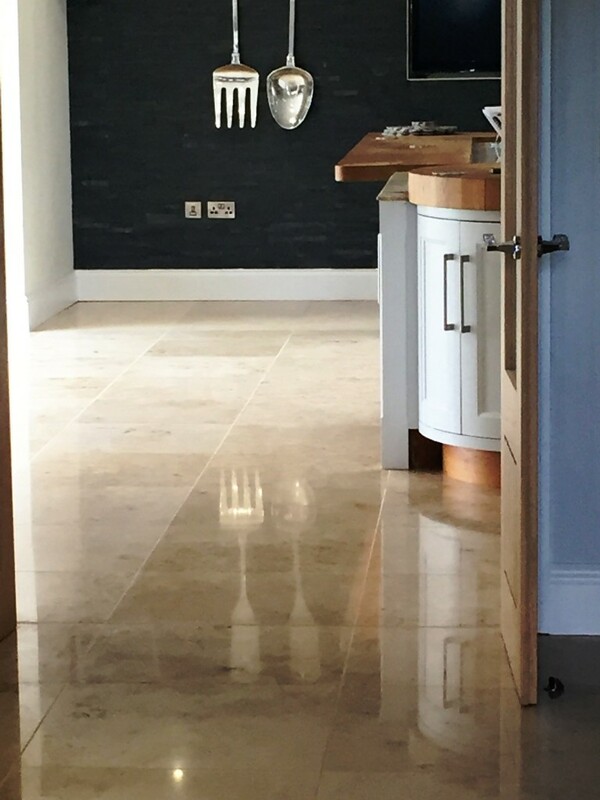 On this particular occasion, I visited a client at a house in the village of Streatley which is a small village that sits alongside the River Thames as it runs through the county of Berkshire. 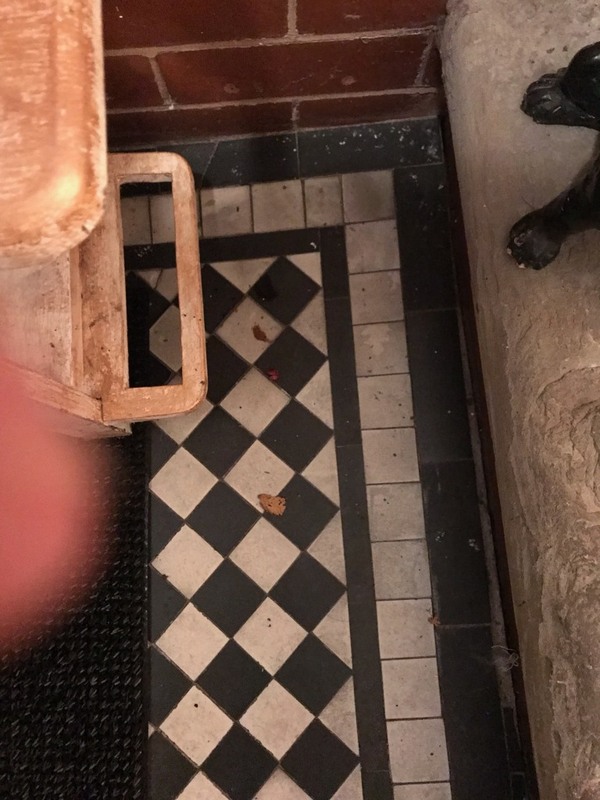 The requirement was to take a look at a very old Marble floor which was initially believed to consist of Victorian, rather than Marble, tiles due to the pattern. 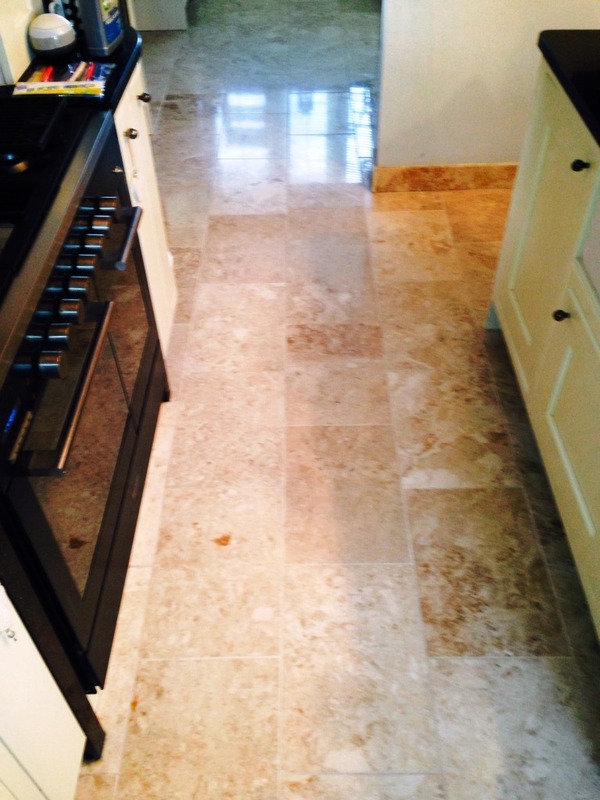 My client simply could not get the white Marble tiles looking their best; many were a displeasing off-cream colour and naturally wanted them looking new again. 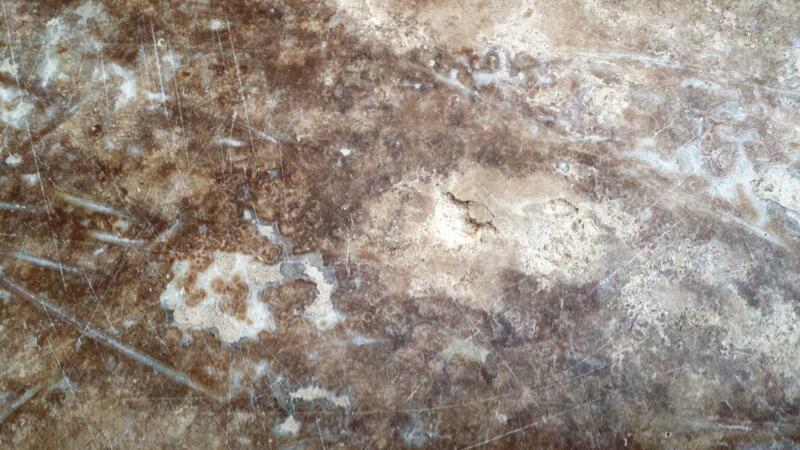 Before beginning the restoration, we confirmed that the stone was actually Marble. 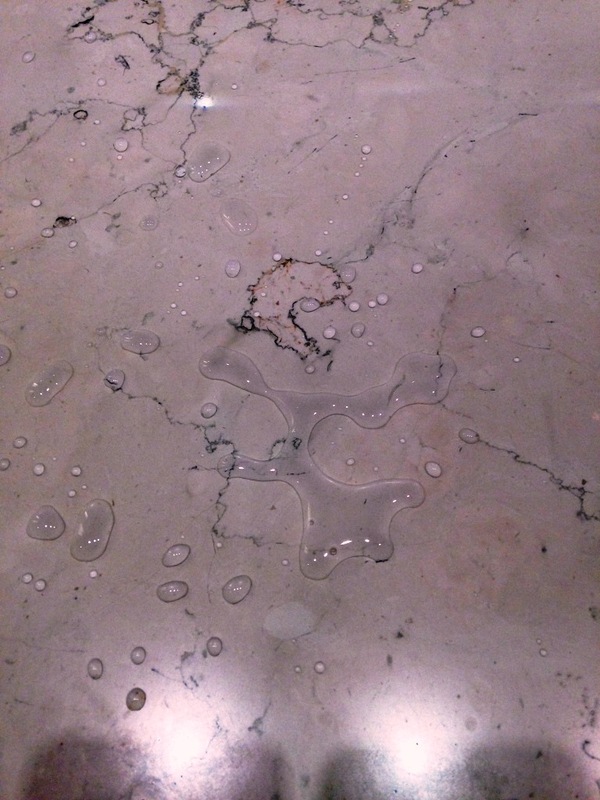 We did this by testing the tile with acid, which the tiles responded to since Marble is naturally acid-sensitive. 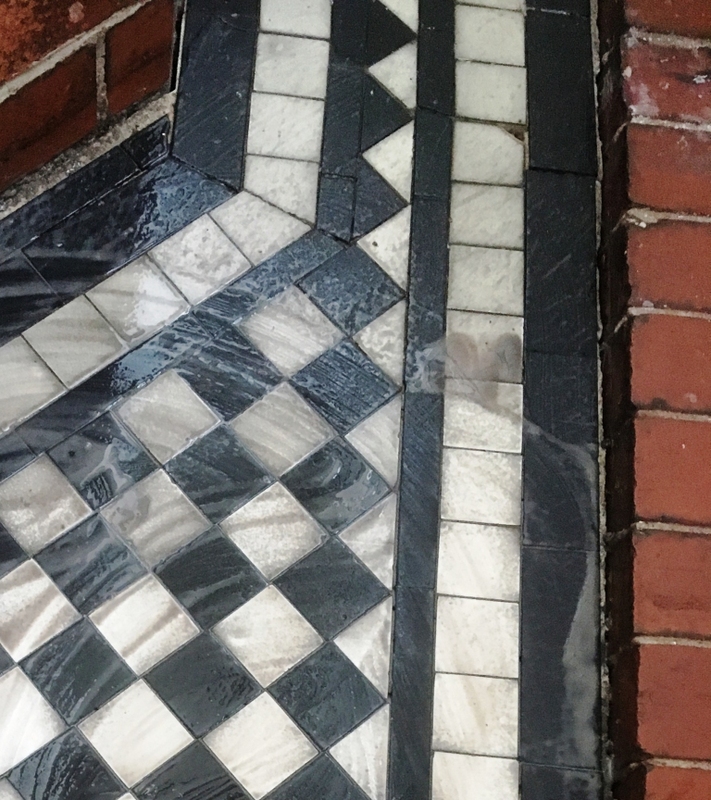 Additionally, we could also see the veins running through the tiles, which you simply would not get with a Victorian tiles. 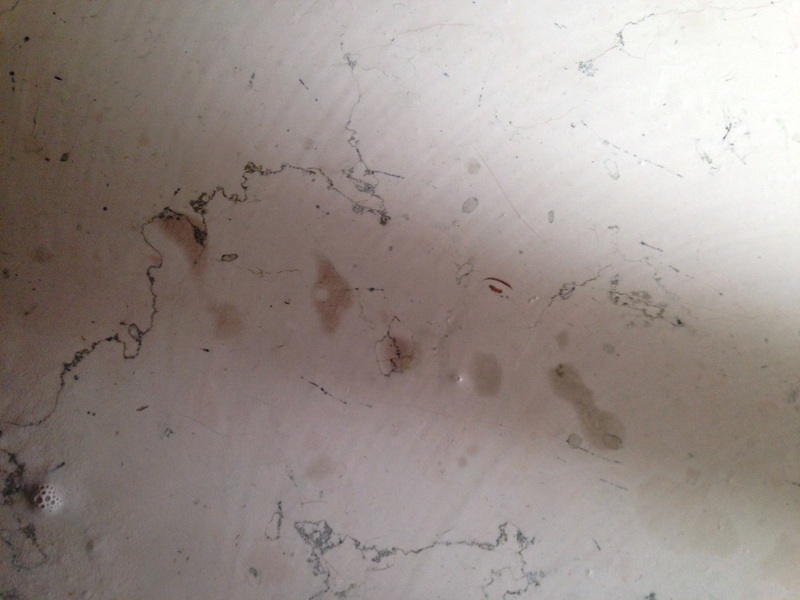 Chemical cleaning had no effect on this floor, so it’s understandable that my client’s attempts at cleaning with everyday household products were unsuccessful. 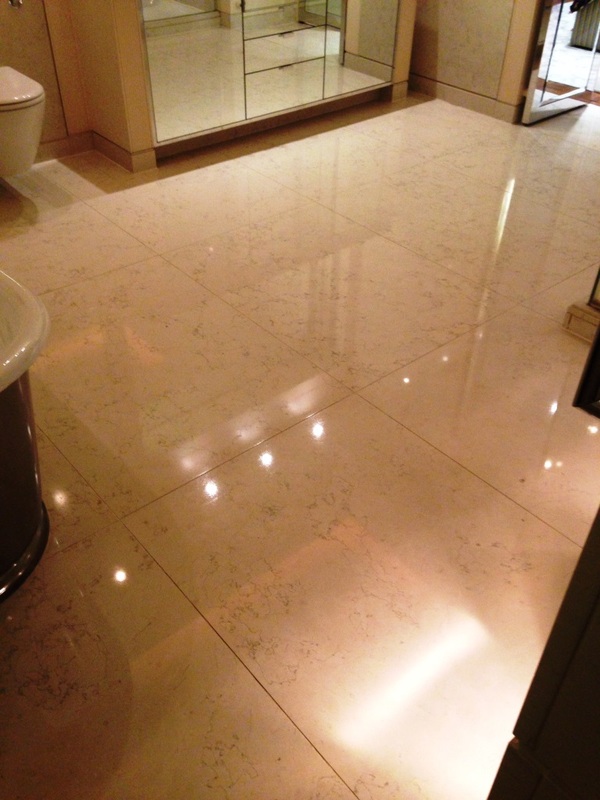 With this type of stone the only method would be to burnish the floor with a set of diamond encrusted pads. I started off by using a Medium 800 Grit burnishing pad to no avail, followed by a Coarse 400 Grit burnishing pad, which was also unsuccessful. 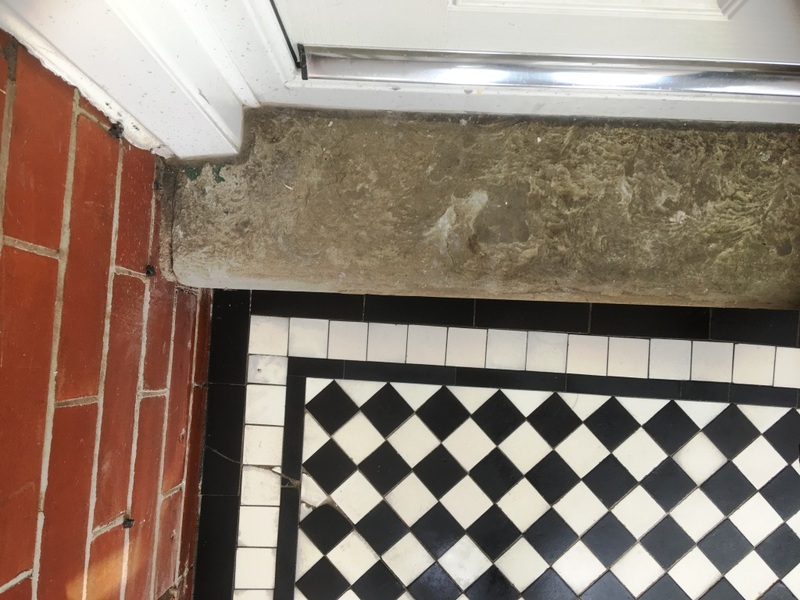 It was only when I used an even coarser 200 Grit pad that some improvement was shown, and it was a very abrasive 100 Grit pad that finally started to achieve the right results. 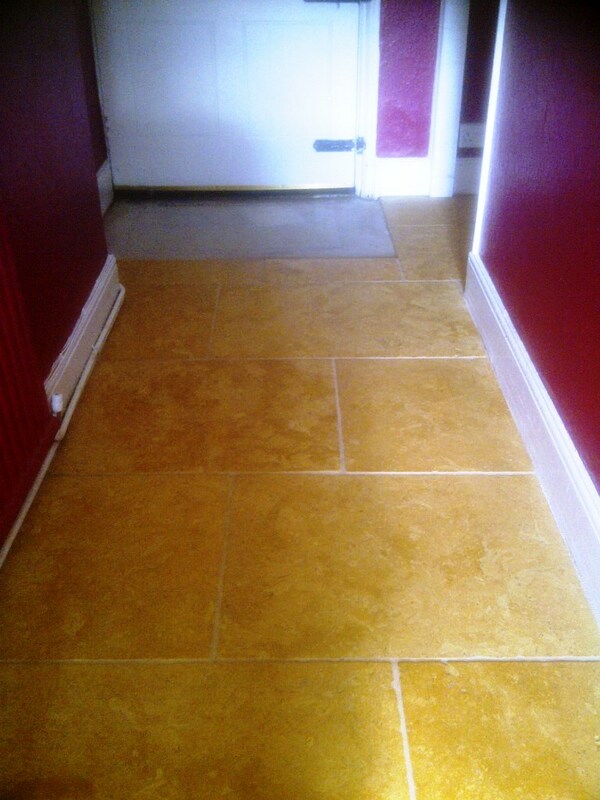 After breaking down all of the dirt, I reverted back to a very fine 1500 grit pad to give the tiles an aesthetically pleasing, light sheen. You use the pads with a little water which lubricates and allows the resultant slurry to be rinsed away. 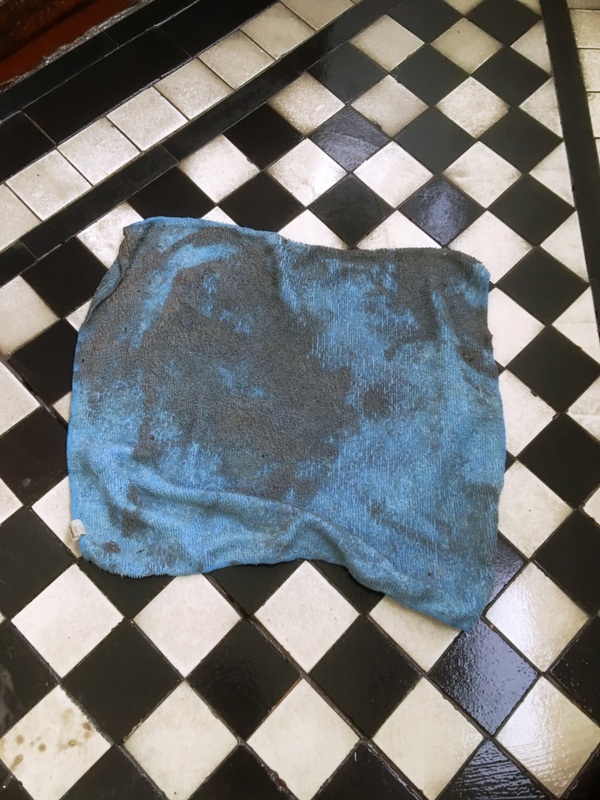 The floor was then allowed to dry overnight and upon my return, I treated the black Marble Tiles with Tile Doctor Stone Oil, which gave the stone its deep black shine you can see in the photo. 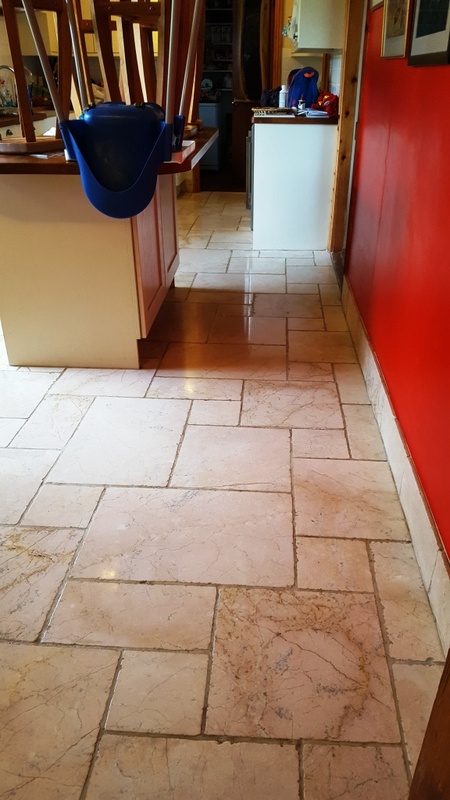 Final step was to seal the Marble floor using two coats of Tile Doctor Colour Grow which is an impregnating sealer that seeps into the pores of the tile enhancing colour and protecting the floor from staining from within. 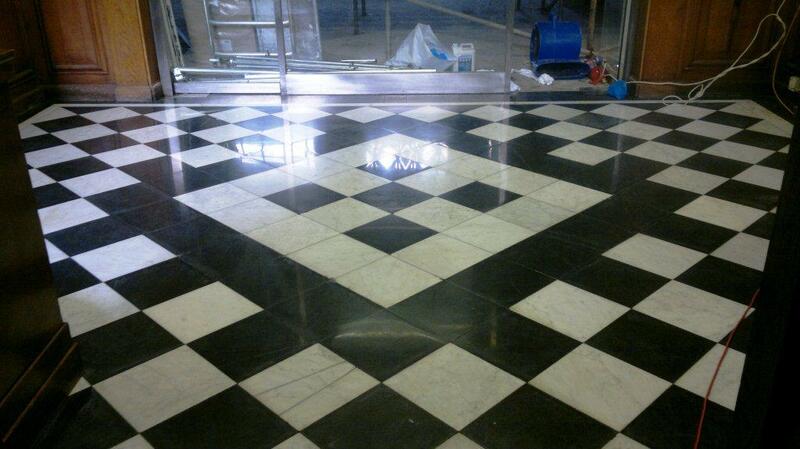 The floor now looks fantastic and back to how it looked when it was first installed. Not too long ago I was called down to a house in the small village of Elmswell, Suffolk. 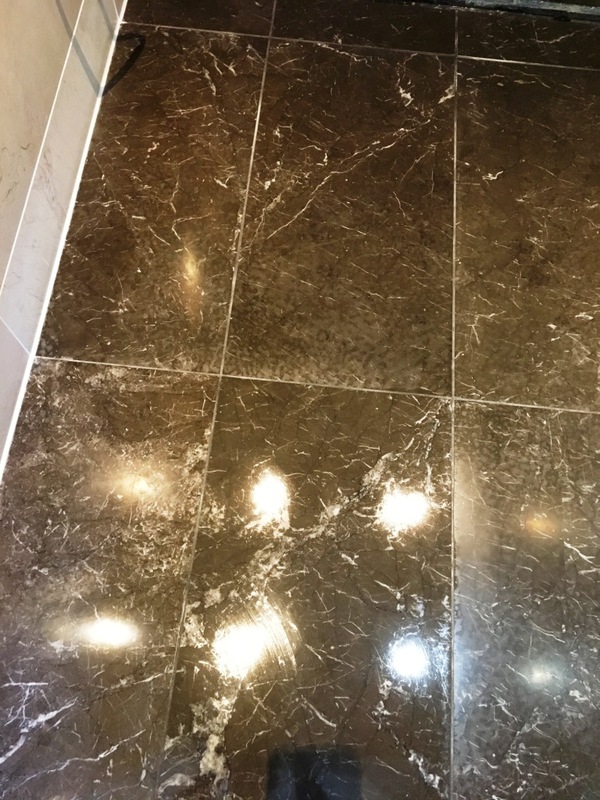 I was asked to take a look at a Marble floor and wall tiles which had become dull and lifeless over time, especially in high traffic areas and now need to be burnished to bring the polish back. 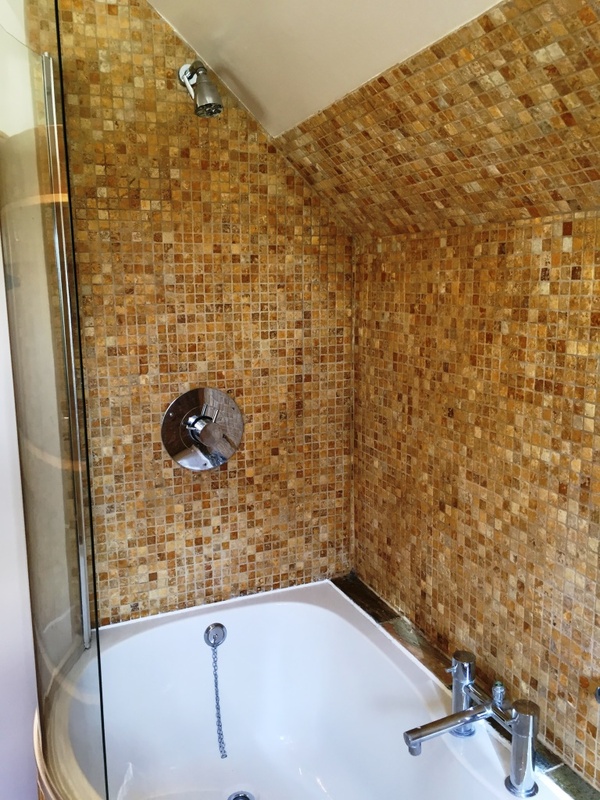 In addition, my client was unhappy with the beige colour of the grout lines, requesting that I change the colour to white following the clean and polish. 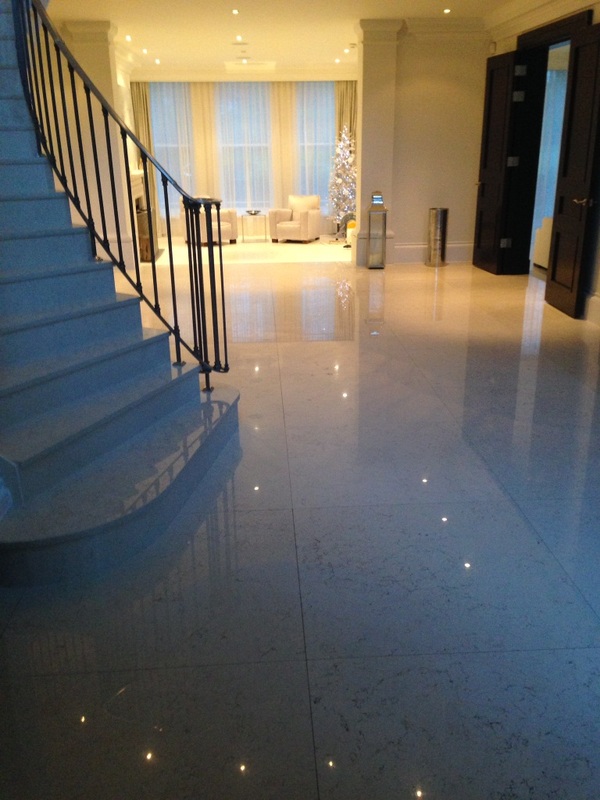 To get the floor clean and bring back the polish I used a set of four diamond encrusted burnishing pads which have different levels of grit, applied to the Marble tiles with a small amount of water. I started with a Coarse pad, before moving on to a Medium pad, a Fine pad, and finally a Very Fine pad to achieve the desired polished look. 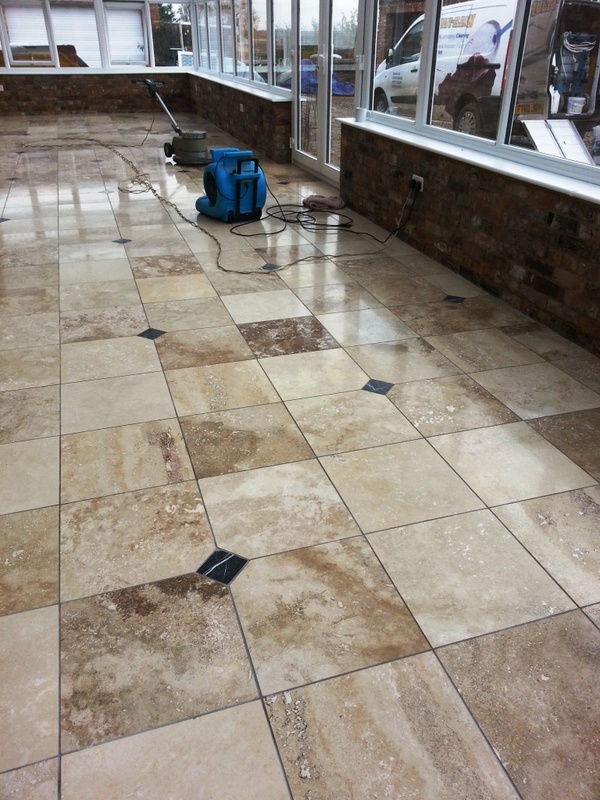 The floor was given a thorough rinse between each pad in order to remove any excess residue that had resulted from the burnishing process. 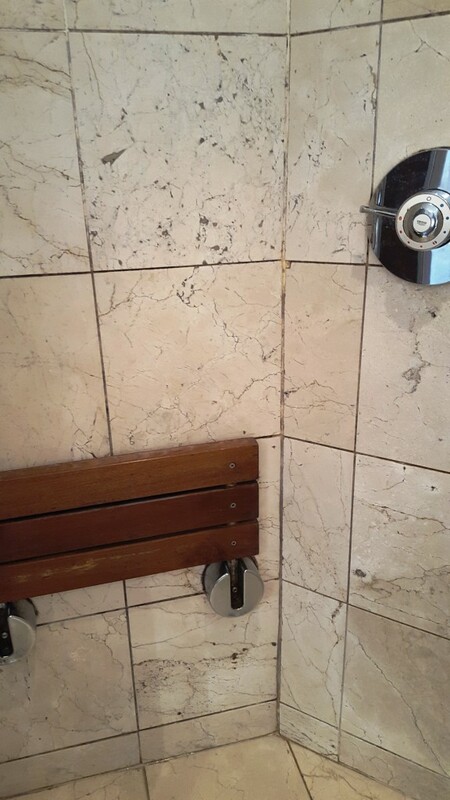 Once I had finished the floors I moved onto the Marble wall tiles in the bathroom where the same process was repeated, for wall tiles however you need to use the smaller six inch burnishing pads fitted to a hand held buffer. 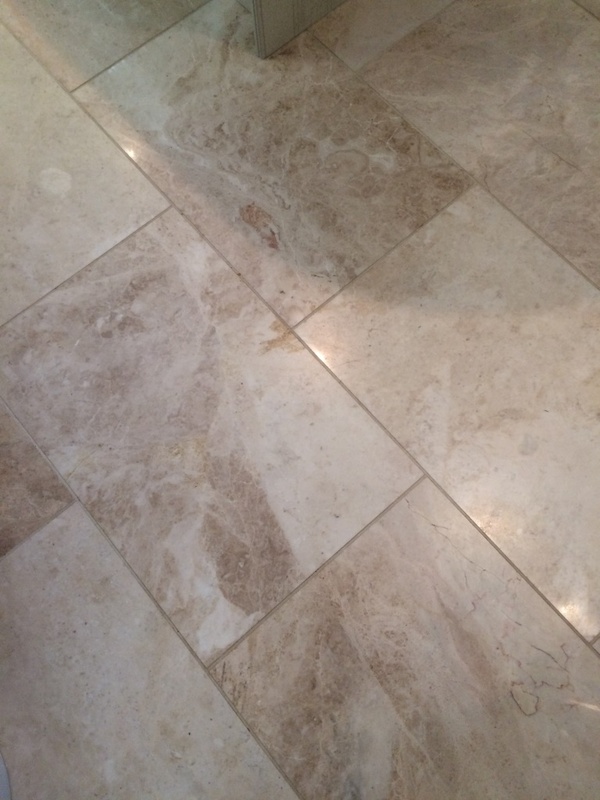 I left the floor to dry for a few days before returning to seal it for which I used Tile Doctor Shine Powder. 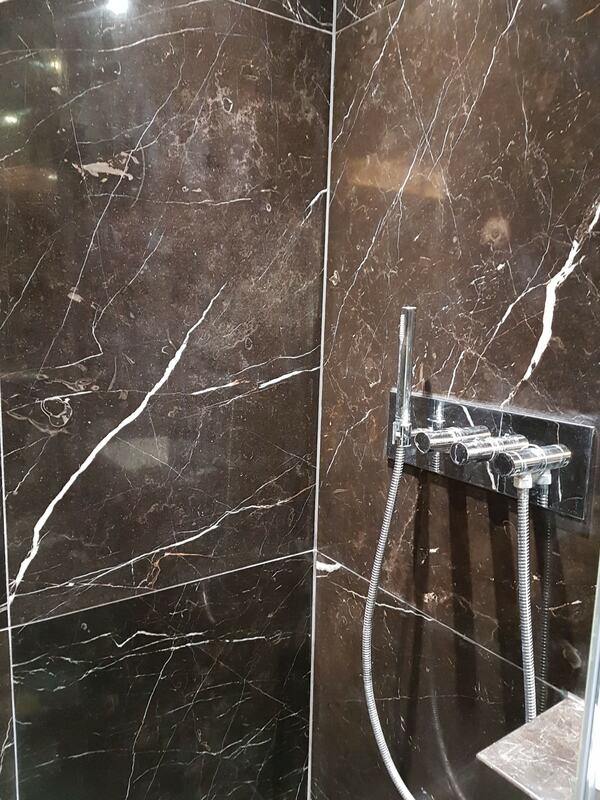 This is a crystallising powder that offers a very high shine and tough durable finish. 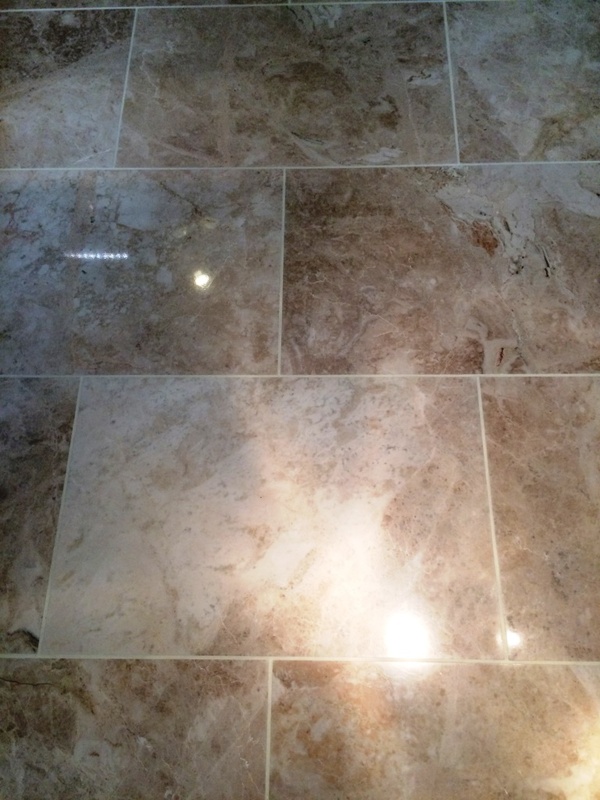 It it ground directly into the tiles, and can be used to seal all natural stone, including Marble, Granite, Limestone, Slate and Travertine, for both interior and exterior floors. 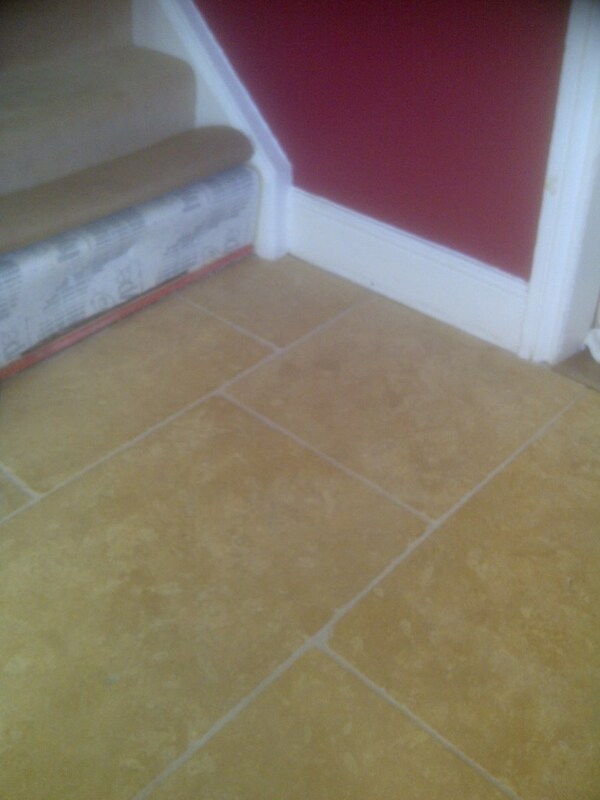 My final task was to change the colour of the grout, as per my client’s request. 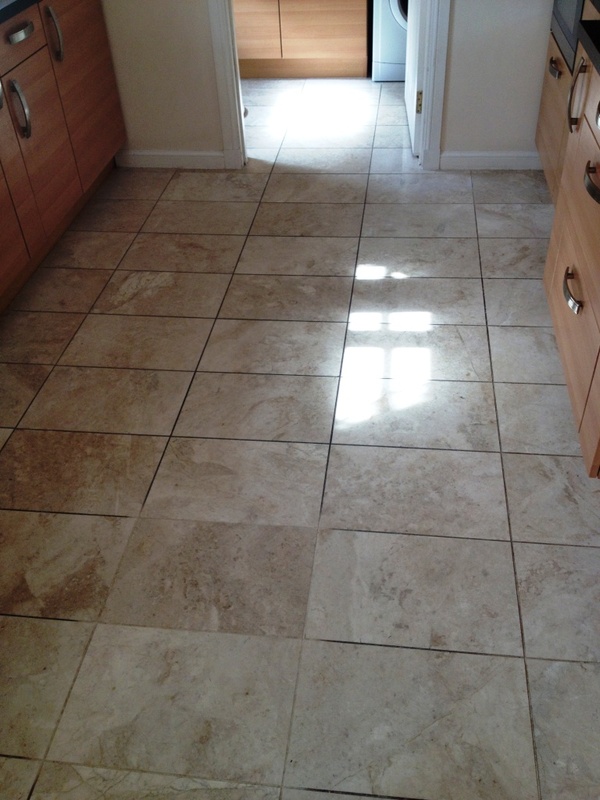 I did this using a couple of tubes of Tile Doctor Grout Colourant in white. 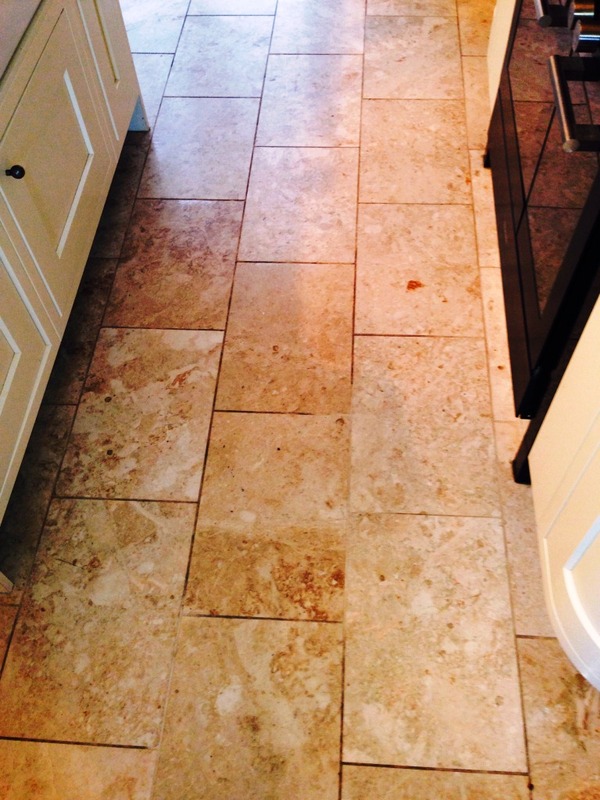 The colourant is painted onto the grout with any excess wiped off the tile before it gets chance to harden. 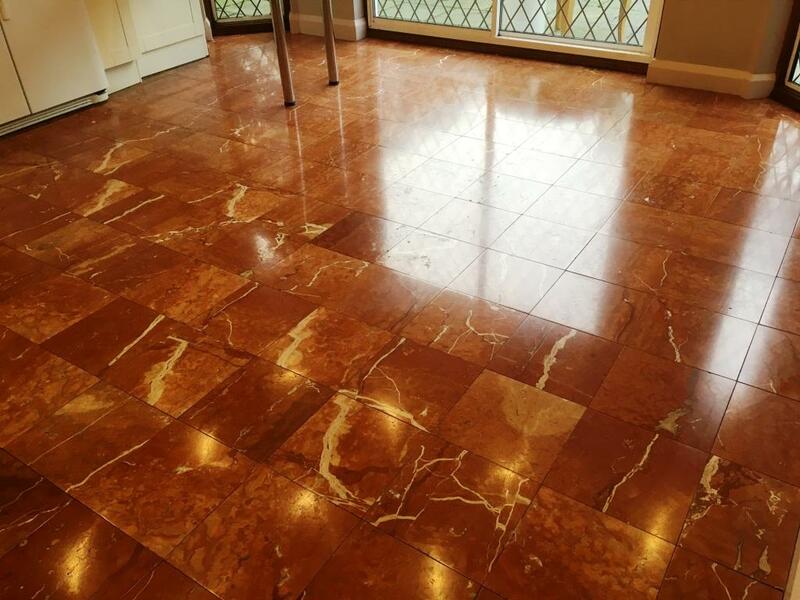 It’s an epoxy product that looks completely natural and additionally provides excellent stain protection for the future. 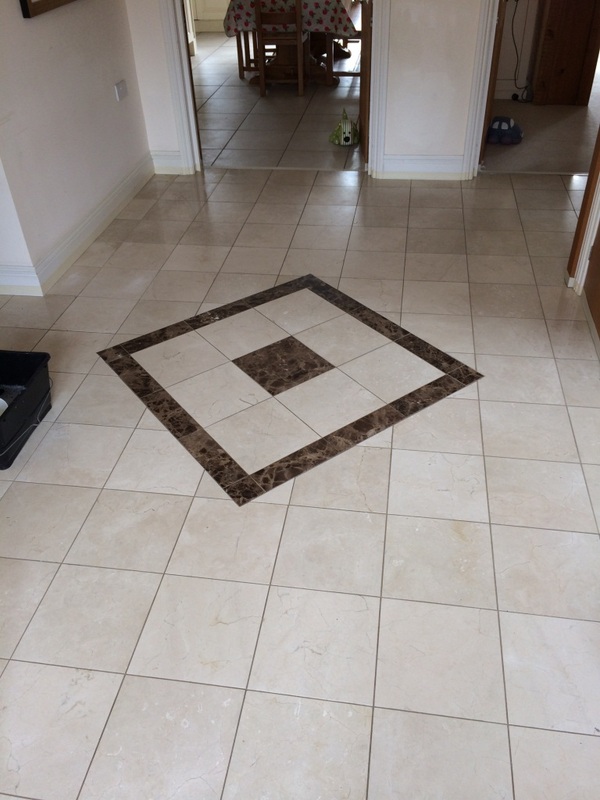 My client was very pleased with the results of my work and took the time to leave the following comment on the Tile Doctor feedback system. 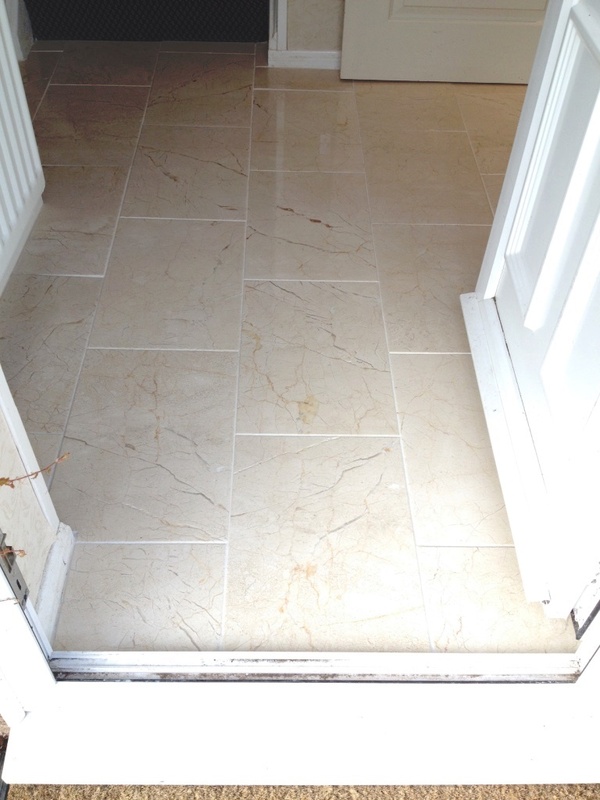 Details below of a Marble Tiled floor installed in the hallway and kitchen of a house in Edinburgh. 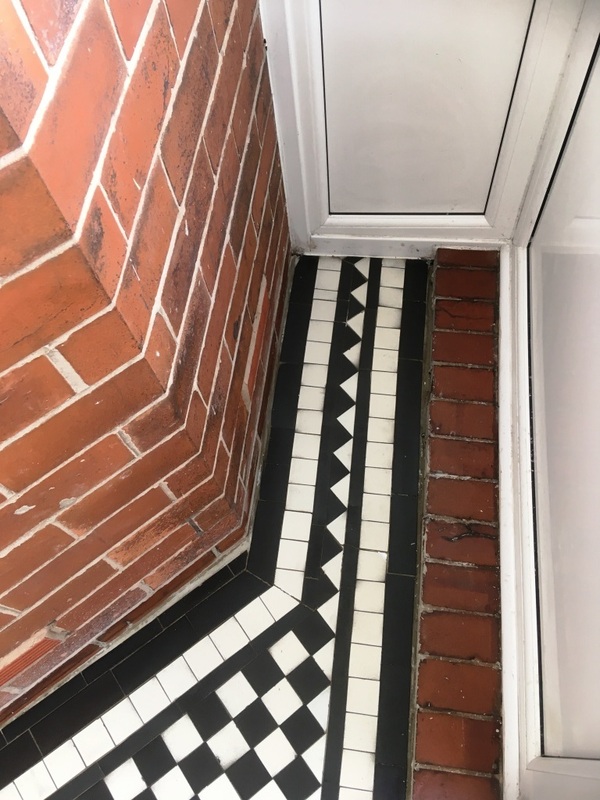 The tiles were in good physical shape but had lost their polished appearance over time resulting in a dull un-appealing finish. 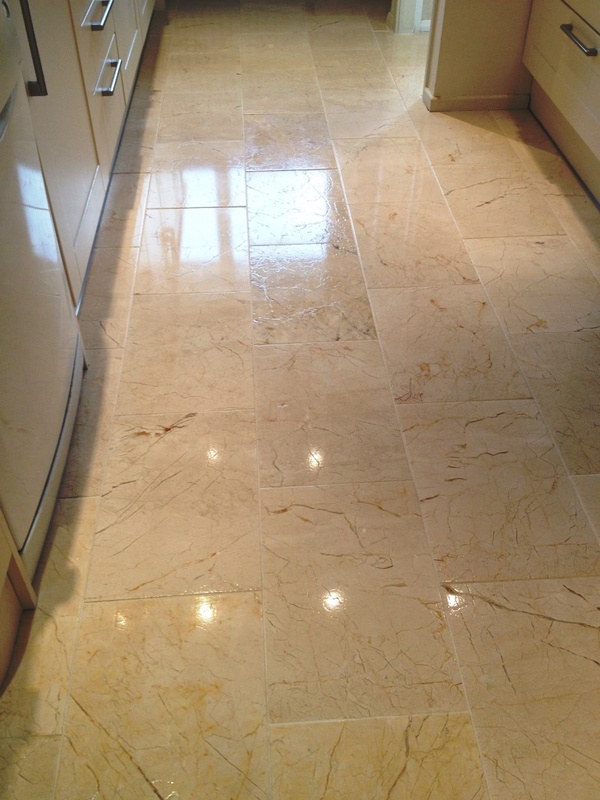 This is not unusual for polished stone especially in high traffic areas such as hallways and kitchens. 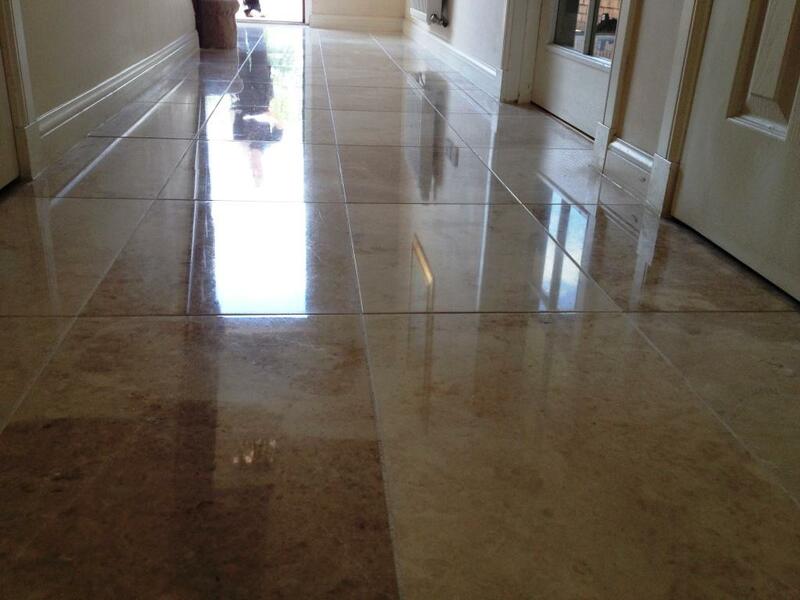 Our first job was to give the floor a general clean to remove grime and dirt especially along the grout lines. 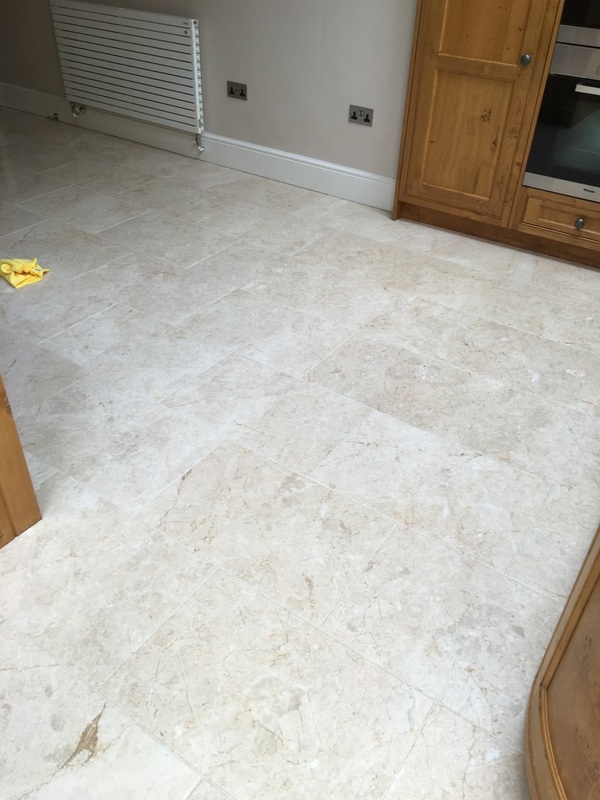 This was done by applying a strong dilution of Tile Doctor Pro-Clean which is left to dwell on the floor before being scrubbed in, Pro-Clean is an alkaline cleaner so it’s safe to use on tile and stone unlike acidic cleaners which can damage the surface of the stone over time. 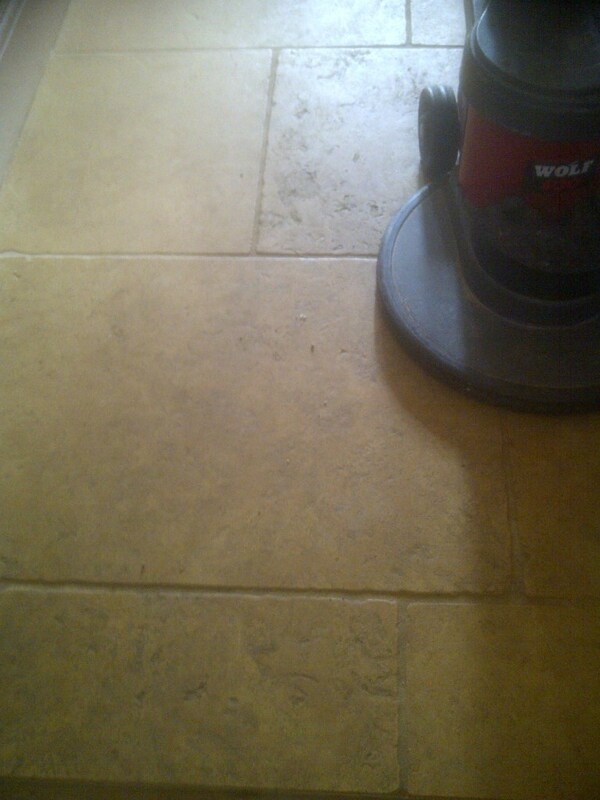 The now dirty cleaning solution was removed using a wet vacuum and the floor given a rinse using water. 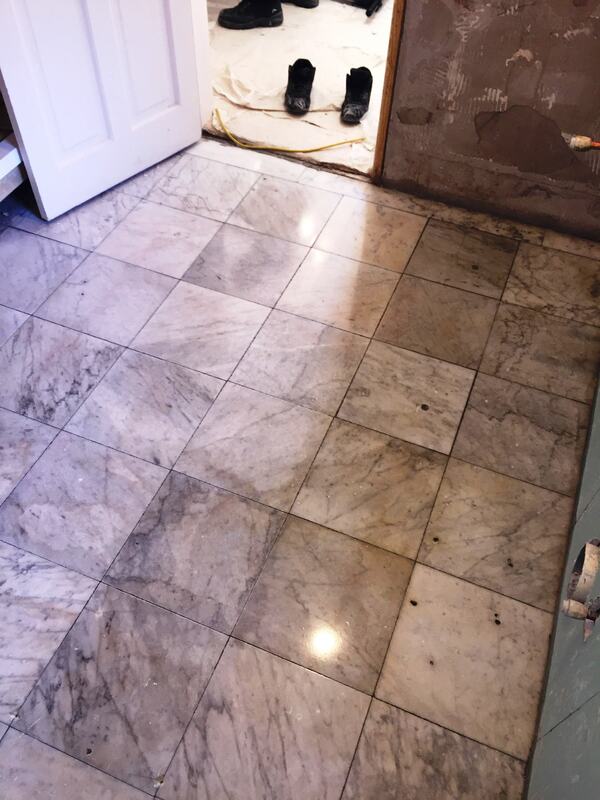 The next step was to burnish the Marble which is a process that removes ingrained dirt and brings up the polish on the tile. 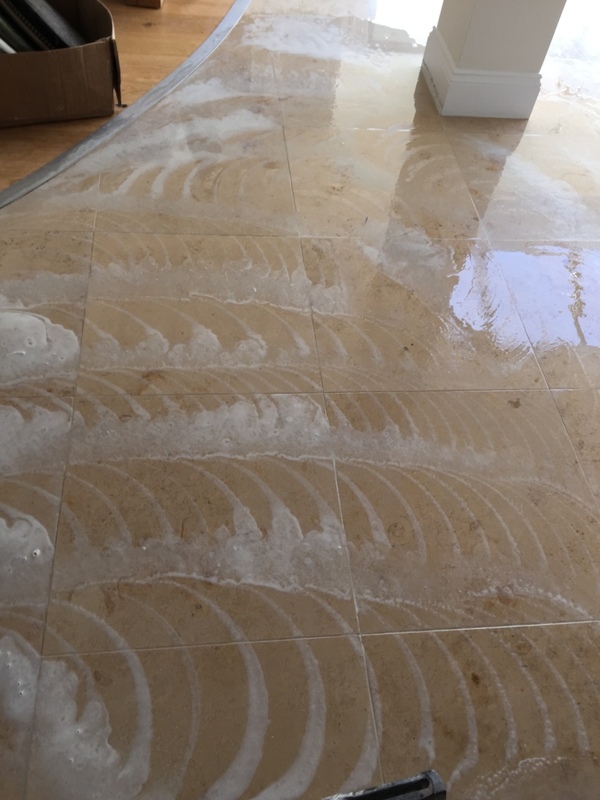 The process involves the application of four diamond pads in sequence; you start with the coarse pad together with a little water and this cuts through and removes surface grime and any surface seal. You then progress through the other finer pads one by one until you get to the final polishing pad which provides a high polish. 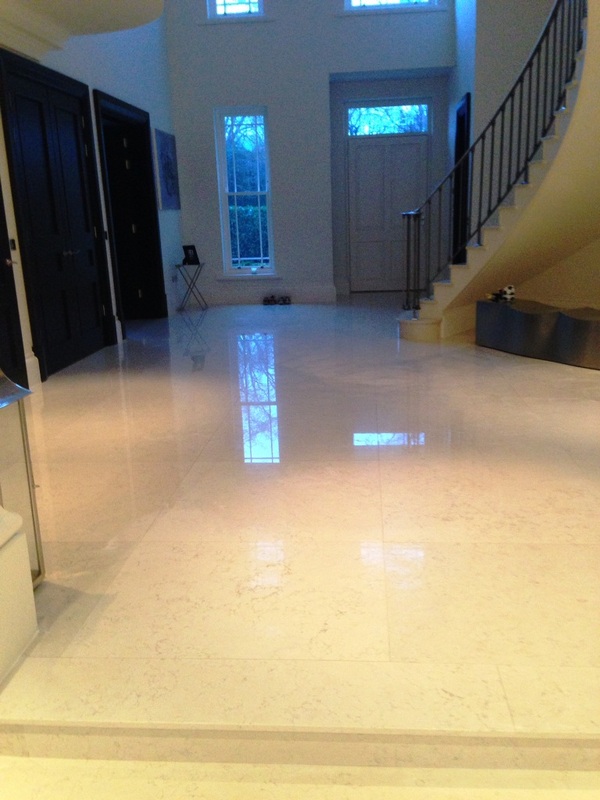 When the Burnishing process was completed Tile doctor Shine powder which is a crystallising powder is worked into the floor using a bonnet machine fitted with a buffing pad and a little water; it adds an extra level of deep shine to the marble floor giving it that extra wow factor together with a tough durable finish. 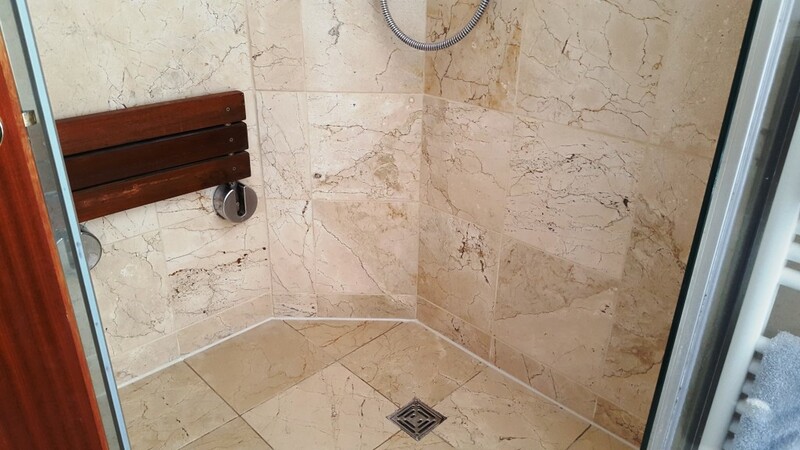 This was an unusual problem; a customer contacted us regarding their Marble shower room at a house in Marlborough where the customer had sprayed Viakal Limescale remover onto the Marble tiles to clean them which unfortunately etched the surface. 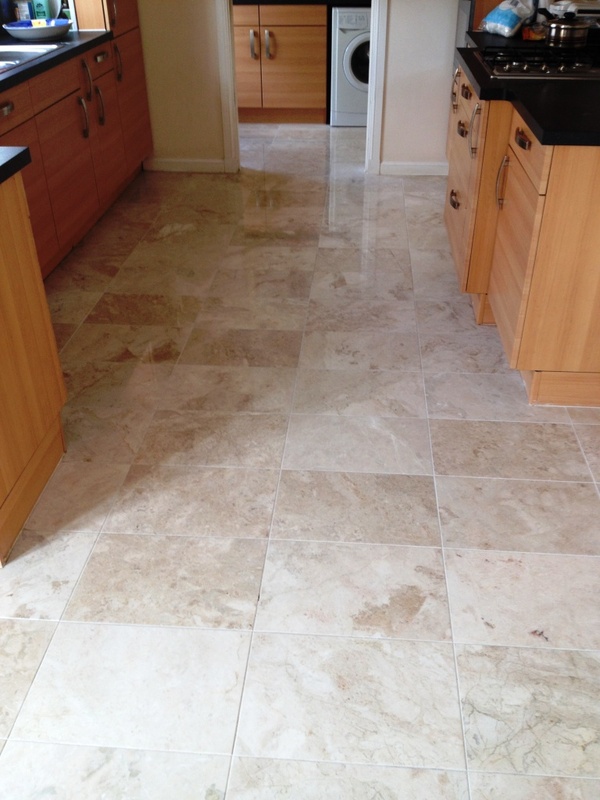 I’ve downloaded the MSDS sheet from the Inernet for this product and can verify it contains a combination of Etidronic, Formic and Phosphoric acids so not a very safe product to use on Marble or any sealed stone surface. 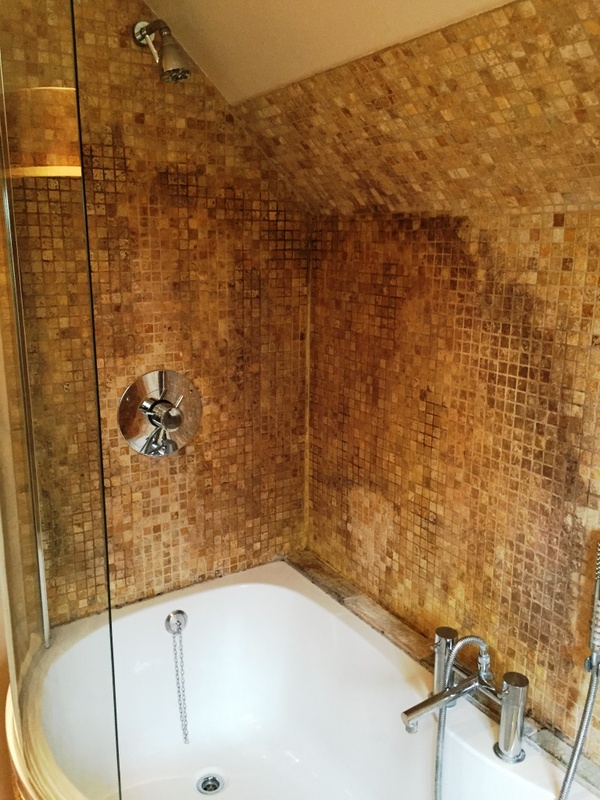 To remove the etching the Marble tiles were burnished using a 6inch coarse diamond encrusted burnishing pad fixed to a hand held rotary machine and lubricated with a spray bottle of water to help keep tiles wet. Burnishing pads come in a set of four from Coarse, Medium, Fine and Super Fine so once we had removed the etching using the coarse pad we then applied the next pads in turn which re-polish the area back to its original shine. 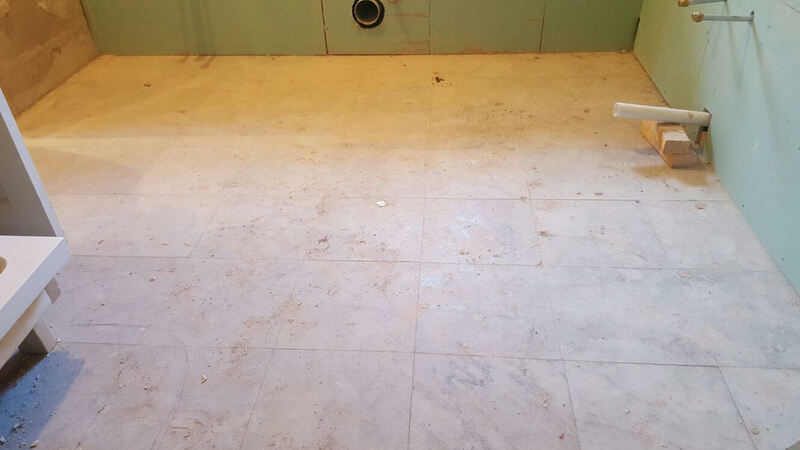 Between pads we rinsed the tiles down to remove any soiled water away; after the final super fine pad was applied the shower tiles were given a thorough rinse down ready for sealing. 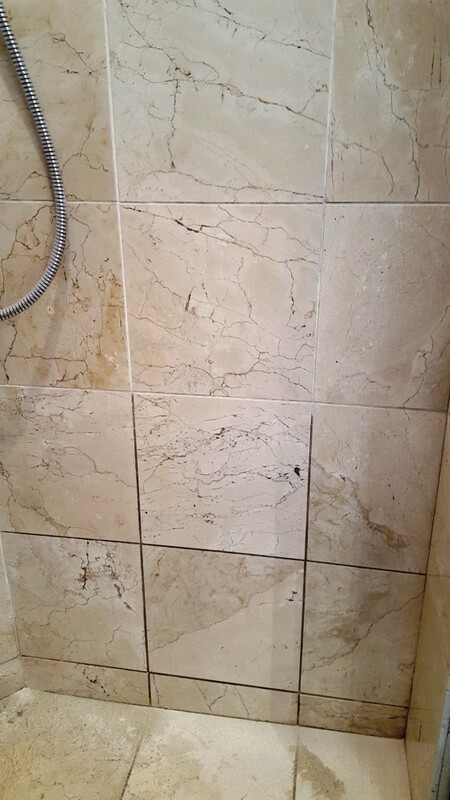 The wall was wiped down and left to dry overnight and we returned the next day to seal the Marble tiles using two coats of Tile Doctor Colour Grow which will protect the tile against water marking and staining from toiletries. 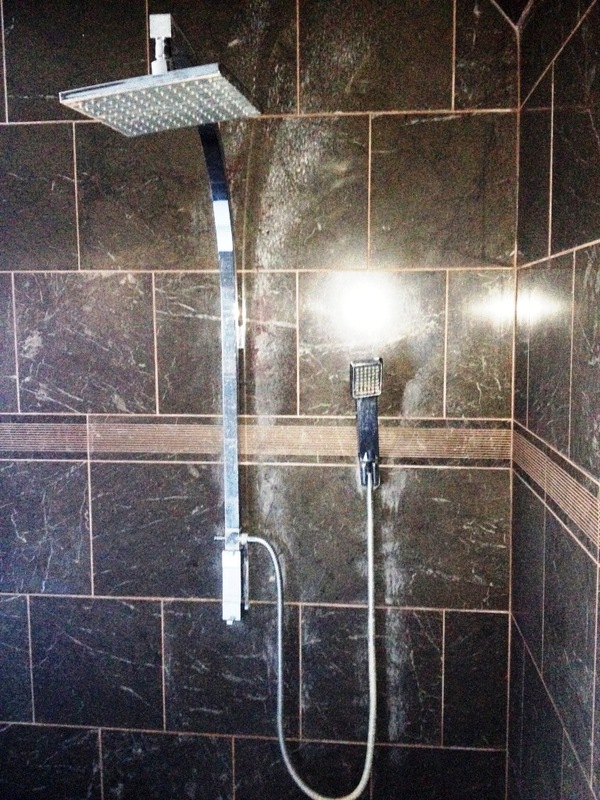 I explained to the customer that the best way to protect the sealer was to simply use the shower head to rinse the walls every time you shower; Tile Doctor also sell an everyday cleaning product for use with showers called Aqua-Pro which is a mild alkaline cleaner that can remove body fats and stains from shampoo and soap products etc. 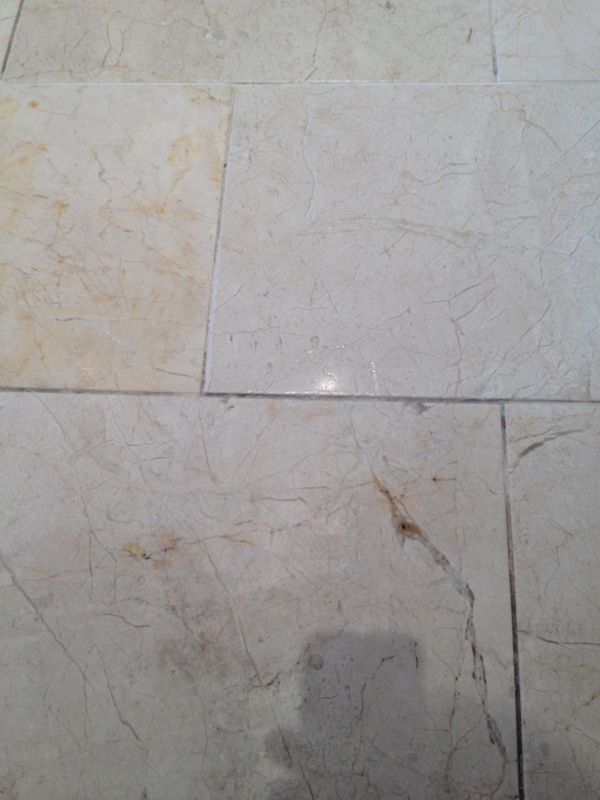 Burnishing the Marble tiles resolved the problem so all is well however if you have a natural stone or sealed tiled surface in your house be warned and always read the label of cleaning products before you use them; if in any doubt do give Tile Doctor a call we are always ready to advise. 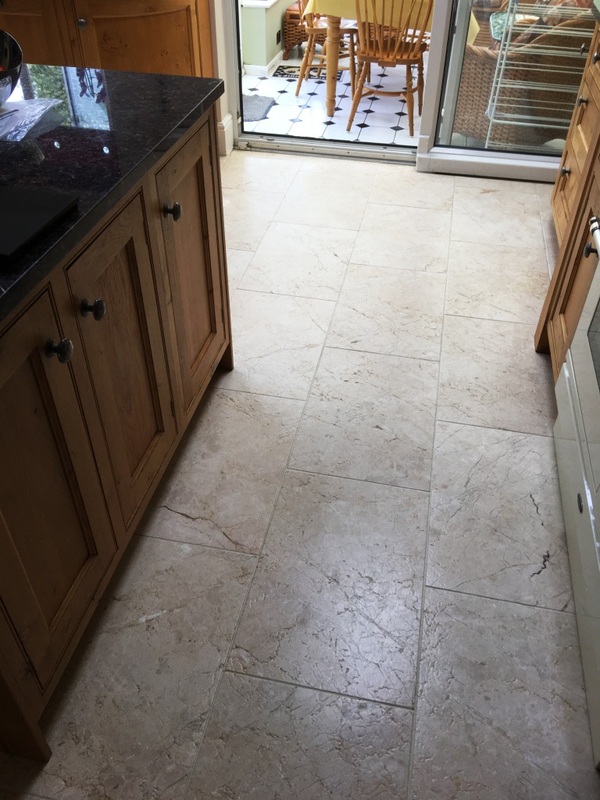 This 50m2 Tumbled Marble tiled floor in Dewlish, near Dorchester had not been deep cleaned and re-sealed for at least five years and showed signs of the normal wear and tear associated with a busy kitchen/dining room and a dog that enjoyed muddy walks. 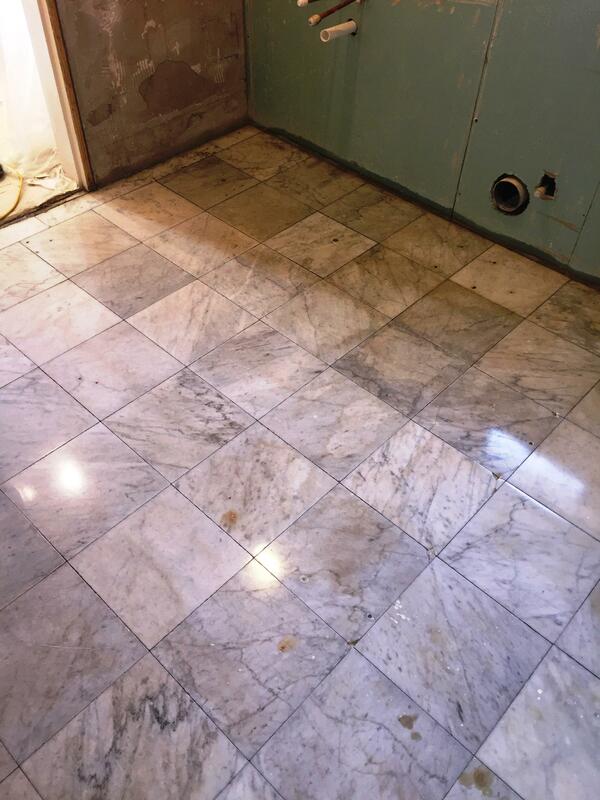 The old sealer was now breaking down allowing dirt to become ingrained in the Marble making it difficult to clean. 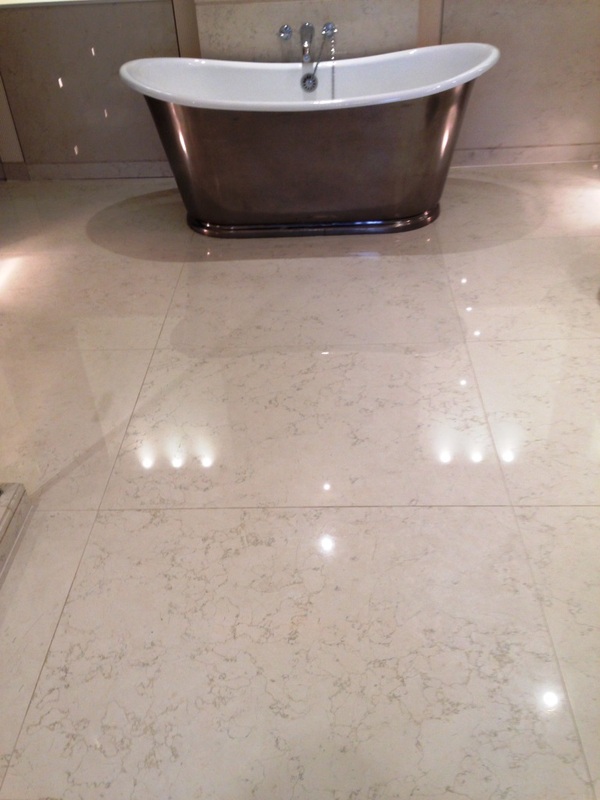 To restore the surface finish it needed to be burnished using a set of diamond encrusted burnishing pads. 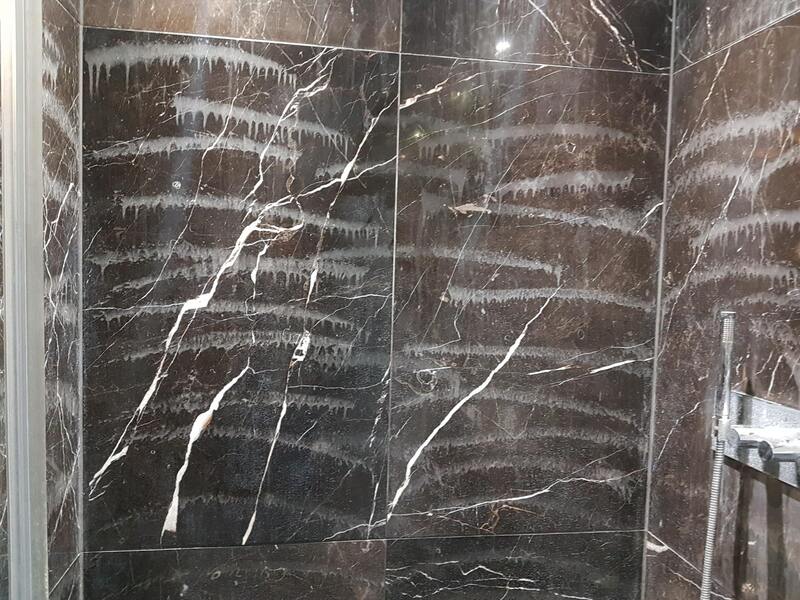 The pads come in a number of different grades from coarse (used to strip off sealers and dirt from the Marble) too very fine (used for final polishing) and are applied one after another starting with the coarse pad and moving through to the very fine pad towards the end. Each stage requires a little water which captures the soil and is rinsed away and removed with a wet vacuum. 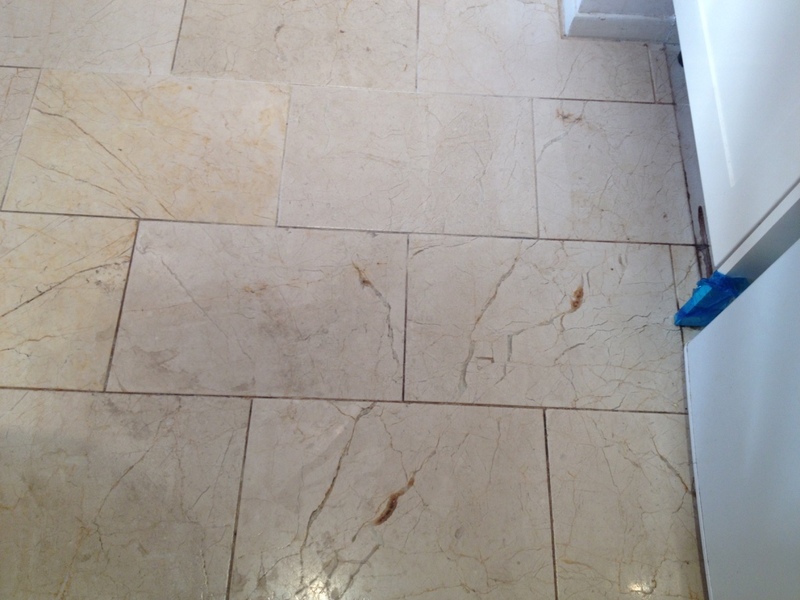 This process completely removed the old sealer and surfaces scratches with a new shine. The floor was given a thorough wash down at this point again using a wet vacuum to remove as much water as possible from the surface before leaving it to dry for the evening. 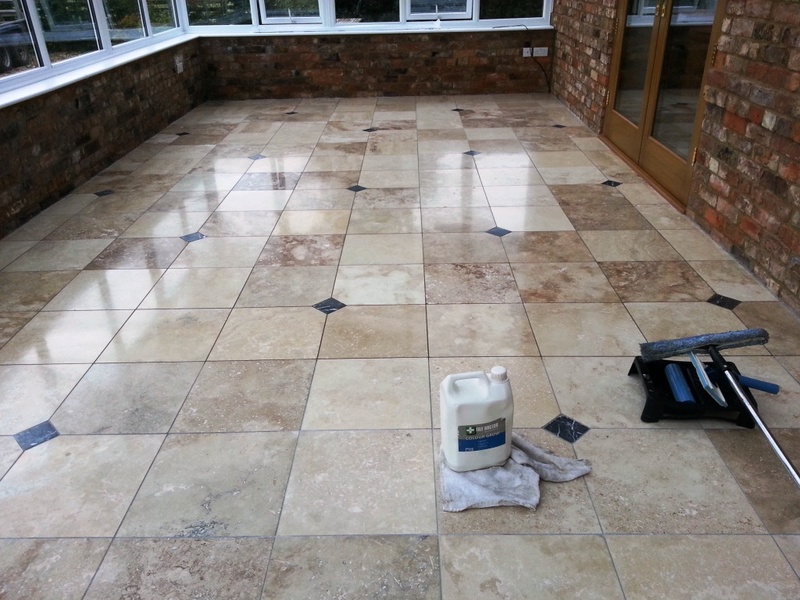 The next day the Marble had dried and I started to seal the tiles using two coats of Tile Doctor Colour Grow sealer which was first applied to a couple of test tiles first to ensure it gave the effect the customer was looking for. 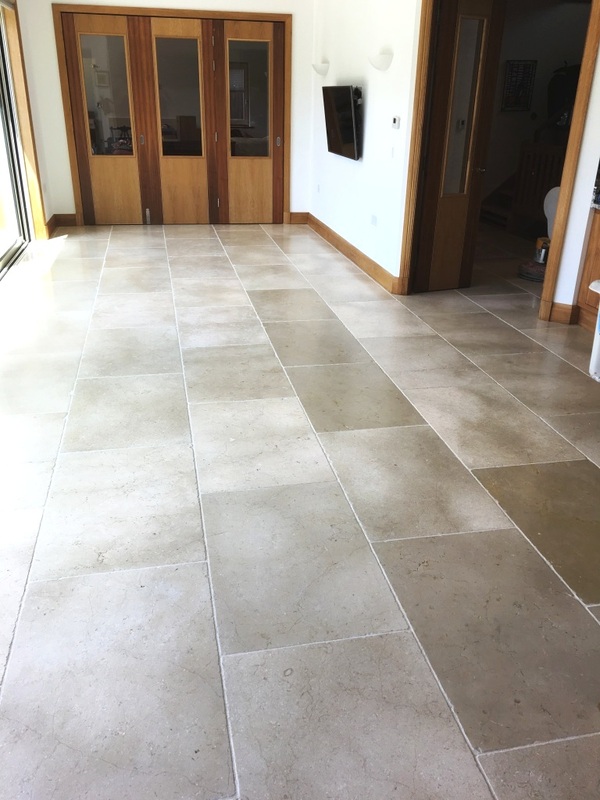 Colour Grow is a colour enhancing sealer that brings out the natural colour of the tile and certainly the customer was pleased with the results so the sealing work continues until the whole 50m2 floor had been sealed with two coats. 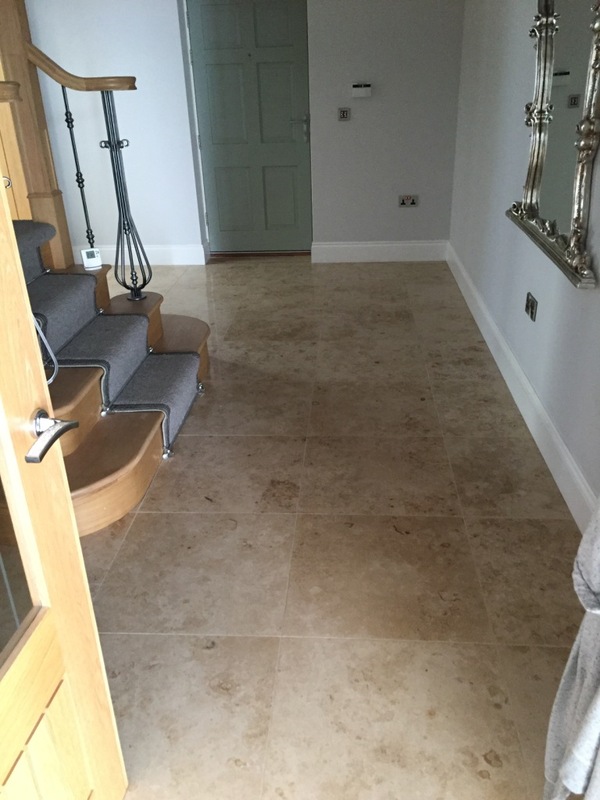 When the whole fifty square metres of floor had been sealed using Colour Grow the effect was dramatic and the owners were so pleased with the result that they invited over a friend with a similar stone floor who immediately asked for her floor to be done in the same way.